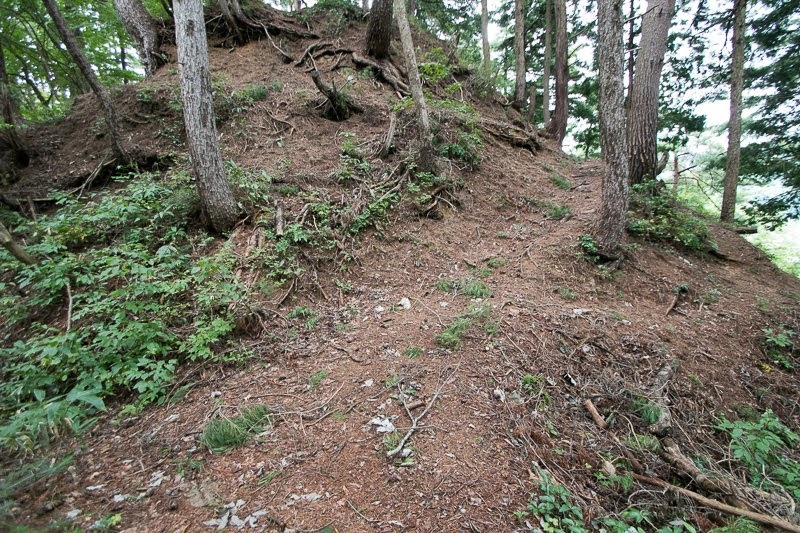 Takahara Suwa castle (高原諏訪城) is built at the edge of a long and narrow ridge spread southward, at the east of current Kamioka town. 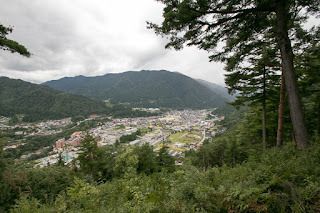 Kamioka town is a small town at the most northeast of current Gifu prefecture, and it is far closer to Toyama prefecture at the Sea of Japan side or Nagano prefecture than the center of Gifu prefecture. Until 10 years ago even railroad was connected to Toyama city. 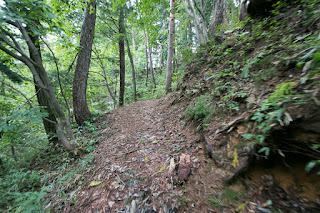 Kamioka town is a small town of about 2 kilometer long and 1 kilometer wide spreads at the valley of Takahara-gawa river. 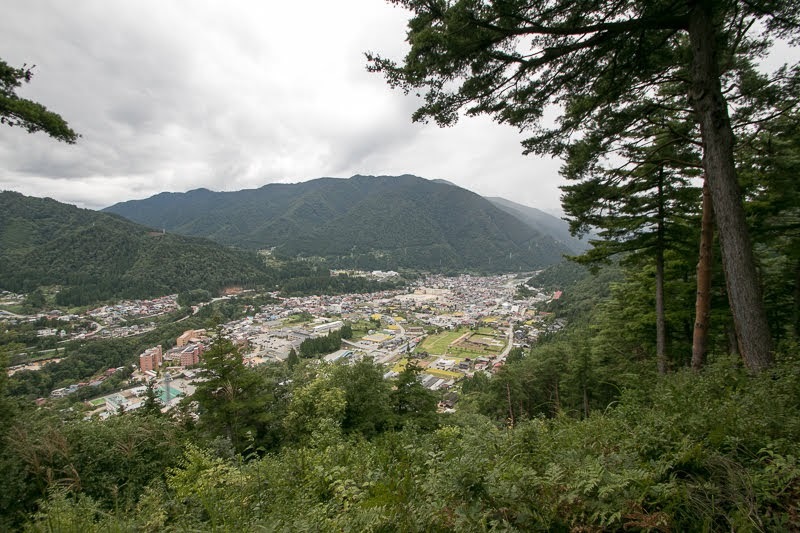 Today it is a quiet town but formerly it prospered by Kamioka mine, which produced Zinc, Lead and Silver and once was one of the largest mines in Japan. 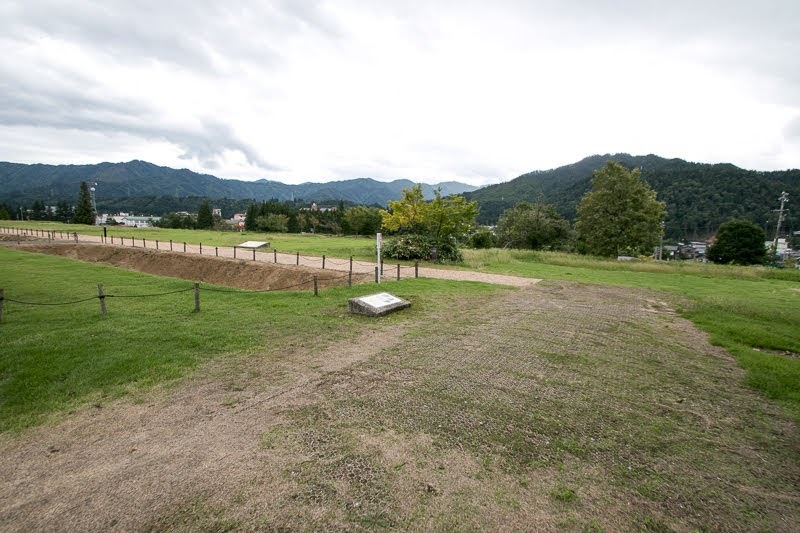 Now mining had ceased, but utilizing vast space in the underground and pure water a neutrino observatory named “Kamiokande” was built at the ruin of the mine, and contributed to the achievement of Nobel Prize. 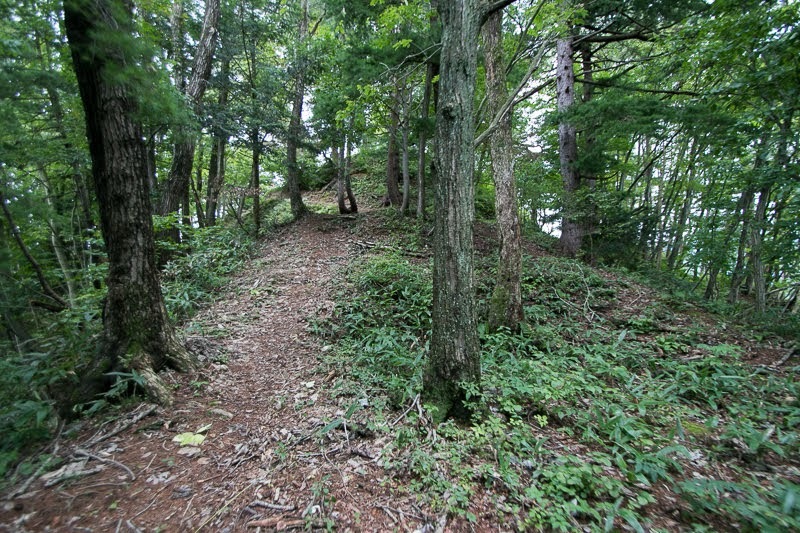 Precise year is unknown but Takahara Suwa castle might be built by local lord Ema clan in 15th century. 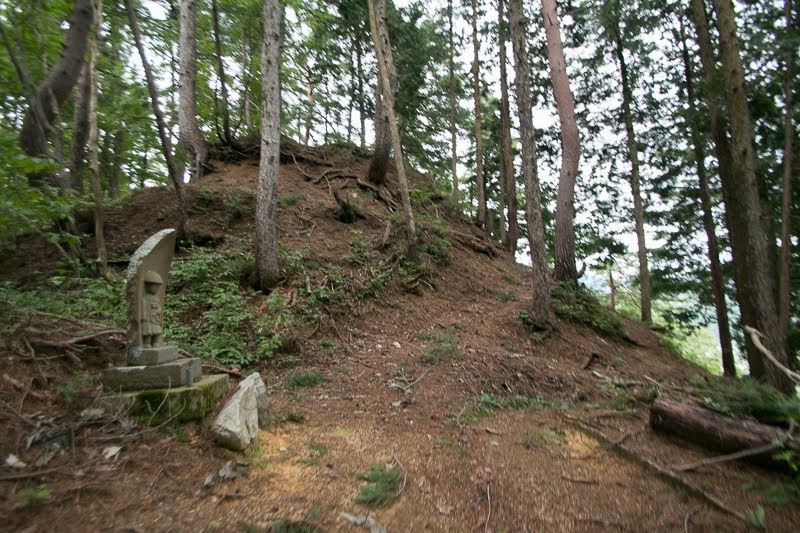 The origin of Ema clan is also not clear but it is recorded as a descendant of Hojo clan, which served chancellor of Kamakura Shogunate. 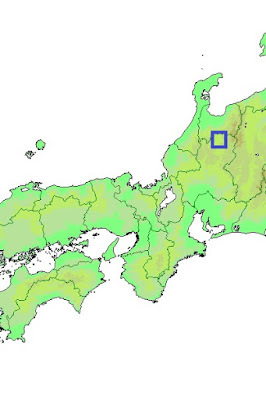 They might be appointed as a lord of Kamioka area by Shogunate then moved to their territory. 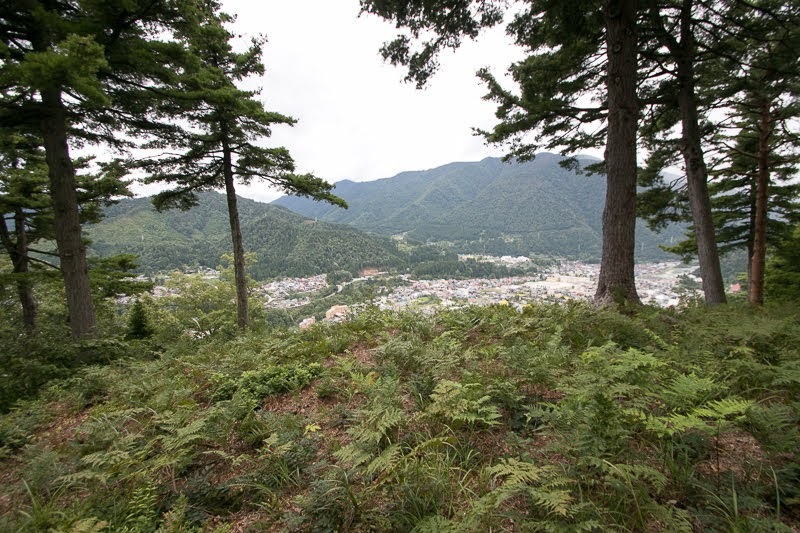 In Muromachi era, Hida province was divided by Anegakoji clan, a high class central noble and the governor appointed by the South Court, and Kyogoku clan which was a high class retainer of Muromachi Shogunate. Anegakoji clan seized north part of the province including current Takayama area, and Kyogoku clan held south part of the province such as Gero area. 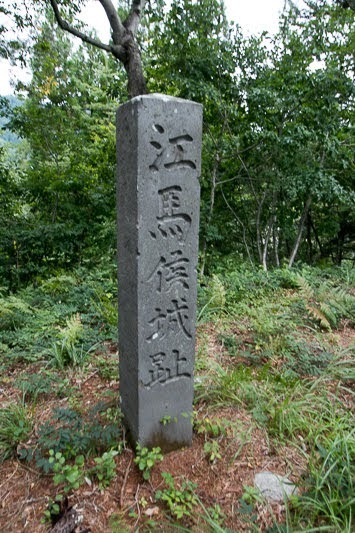 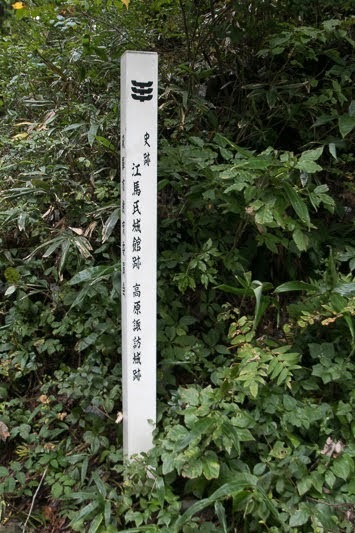 In 1411, Anegakoji clan was subjugated by Muromachi Shogunate army and lost their position, then divided into three branch families such as Kojima family, Mukai-Kojima family and Furukawa family. 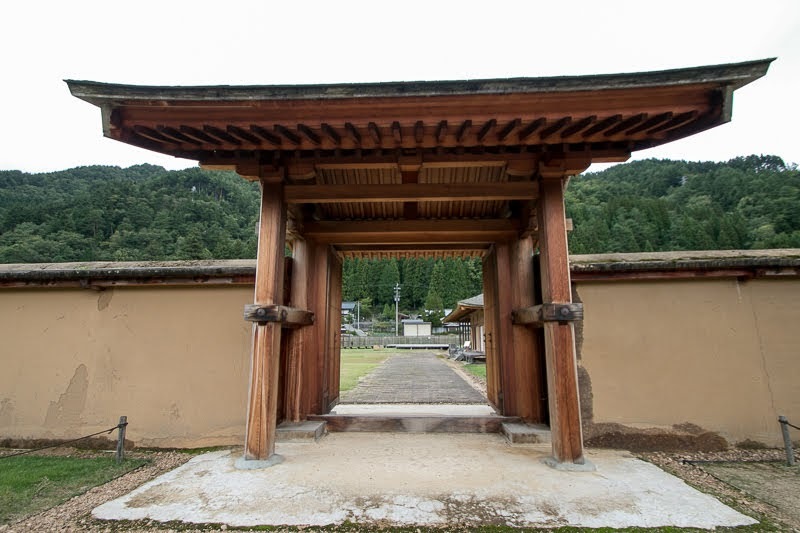 In spite of their small size, Anegakoji clan had cultural talent stem from their origin and had connection to central government then barely survived. 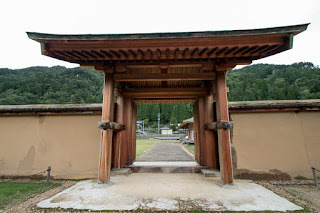 But local lords including Ema clan became independent utilizing the decline of Anegakoji clan. 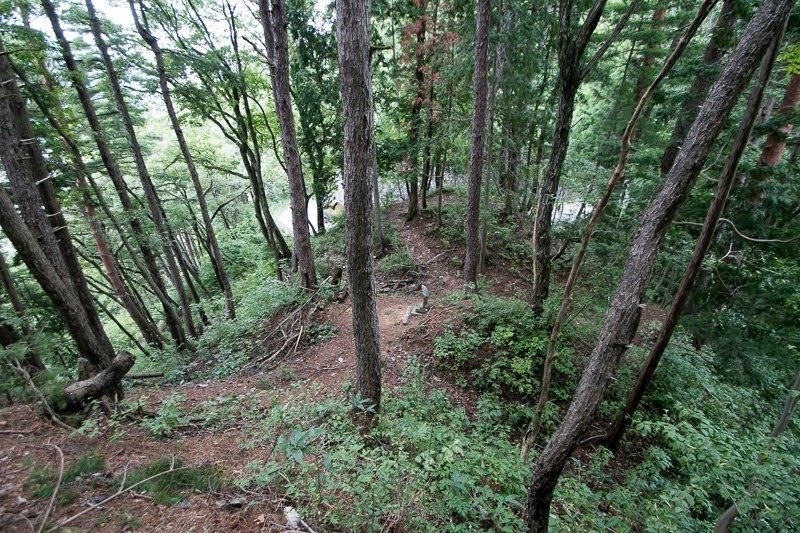 In spite of quite limited territory and population, Ema clan increased their power utilizing Kamioka mine. At this point Zinc was not used, but silver brought income to Ema clan along with Lead which became used for bullets of matchlock guns. 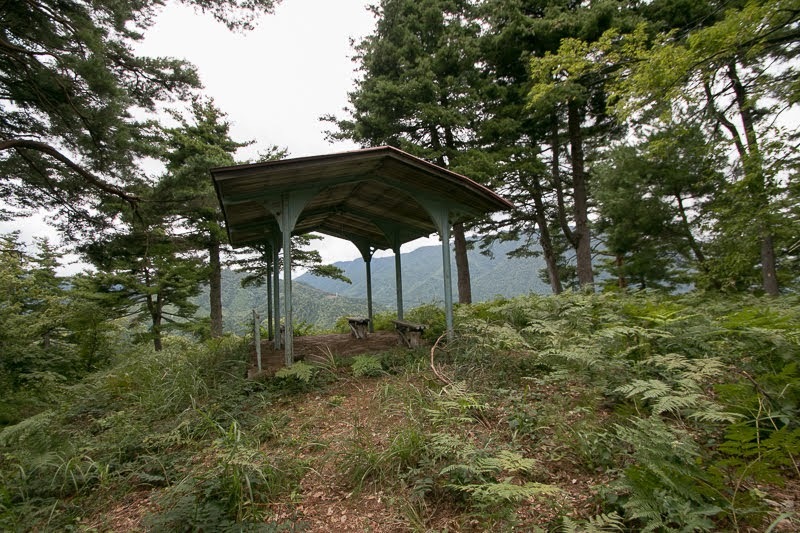 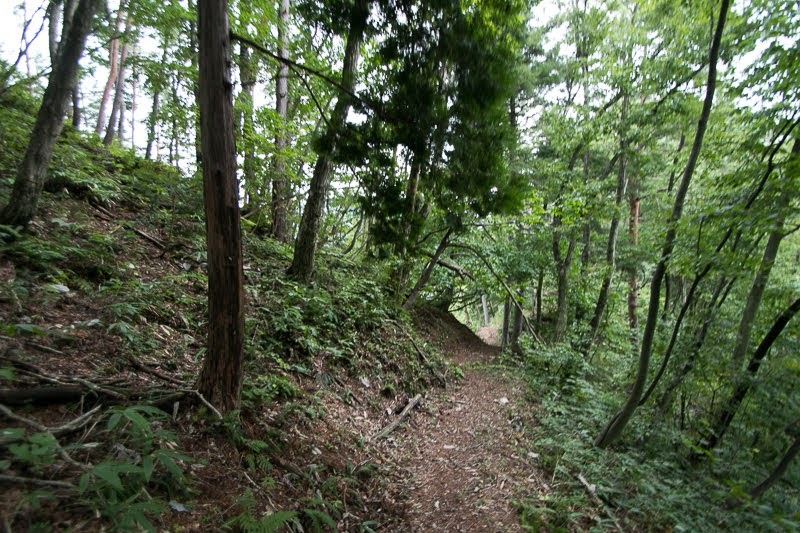 Ema clan built their residence at the most inner part of flat area, and constructed Takahara Suwa castle on the backside mountain in case of emergency. 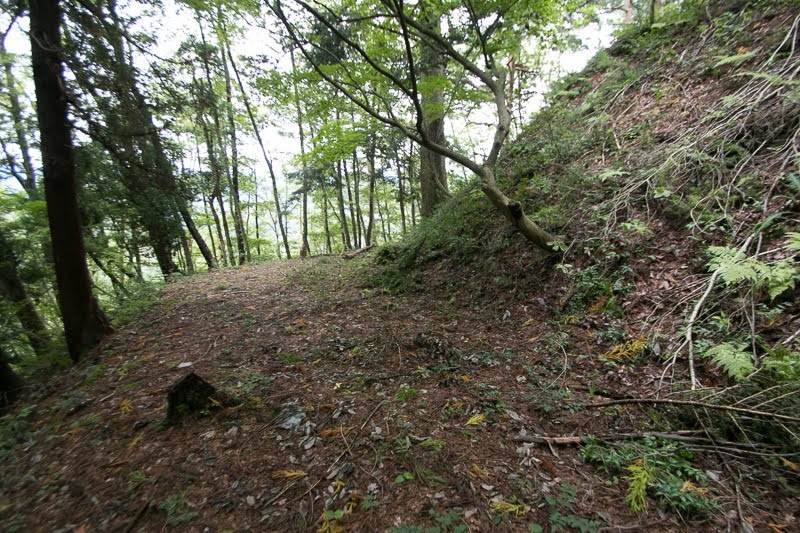 Structure of Takahara Suwa castle roughly consists of north part and south part separated by huge dry moat of 20 meter wide. 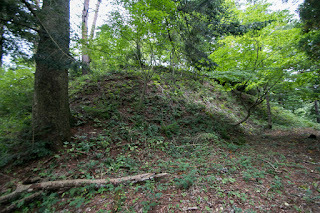 Central area of the castle is a rectangular one of 40 meter long and 20 meter wide, which is surrounded by clearly shaped clay wall. 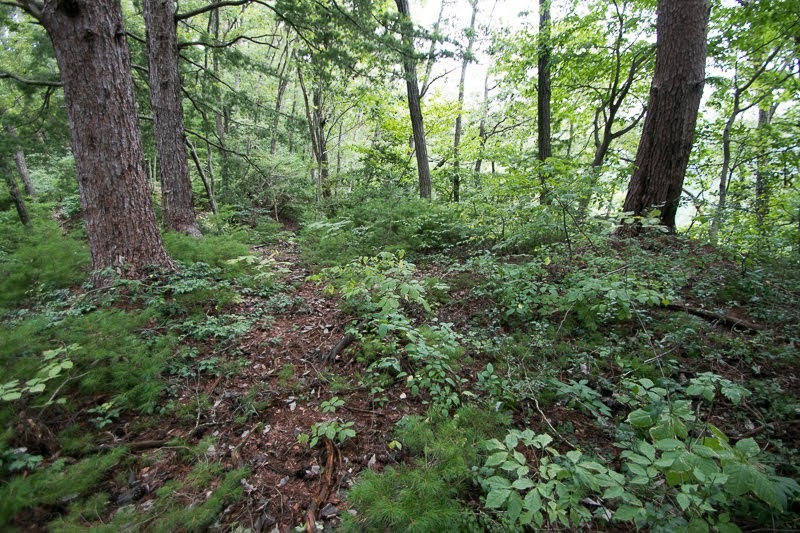 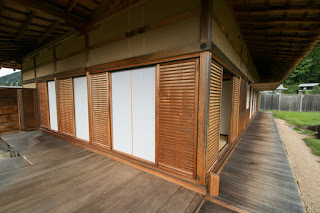 At the below of central area, a corridor area wholly surrounds which is about 20 meter wide. 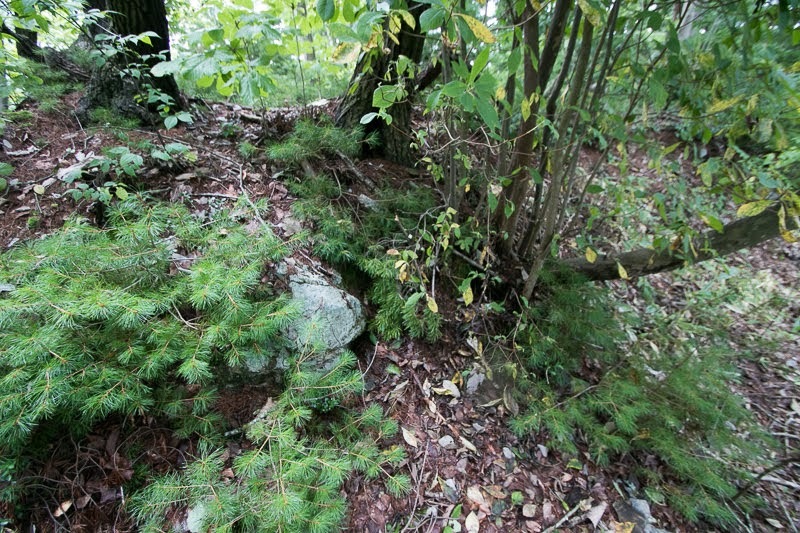 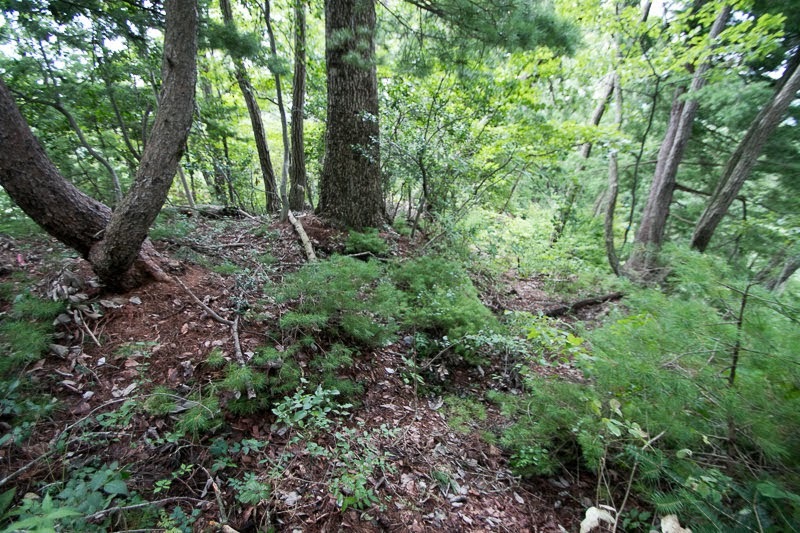 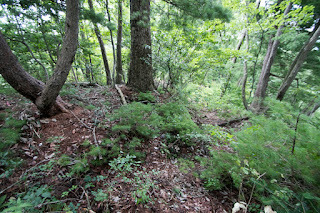 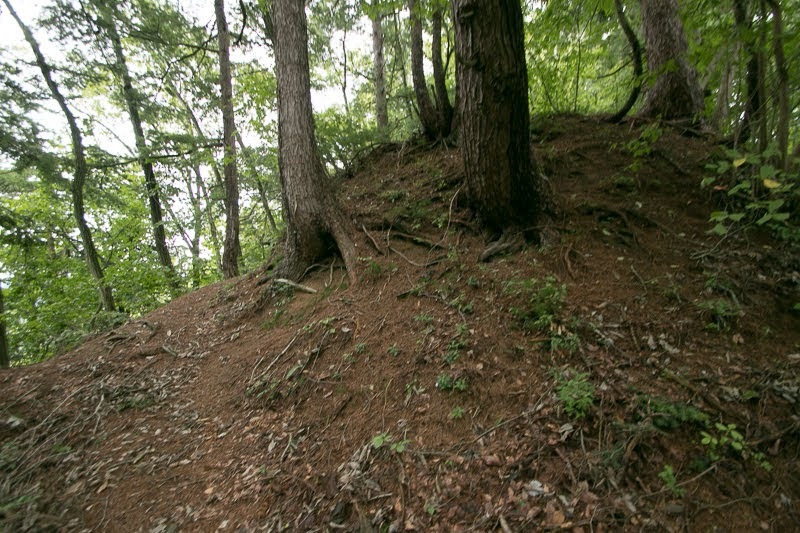 Each corner of this area is protected by combination of vertical and horizontal dry moats. 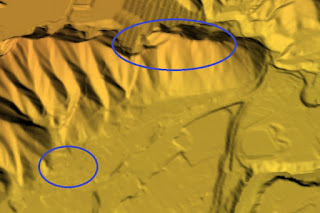 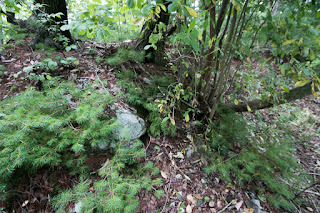 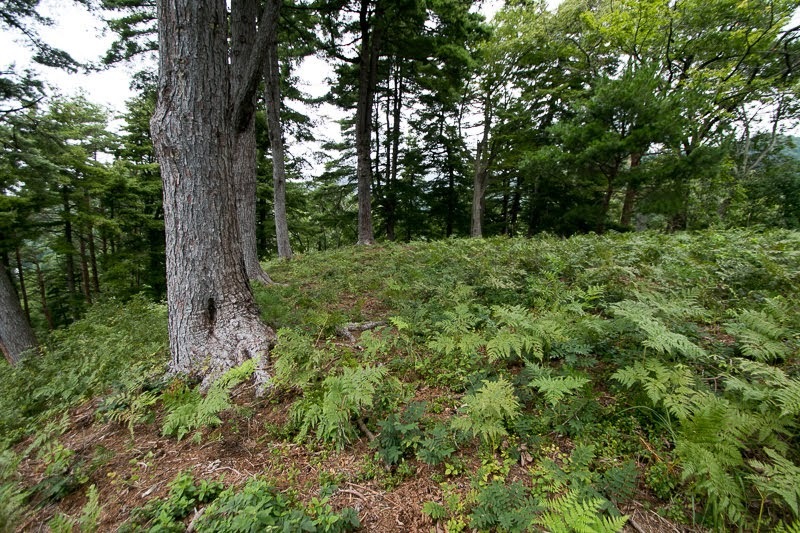 Contrary to large and simple north part, south part which might be a front fort has a technically defense facilities, Path from outside is folded several times, and there is a ruin of low height small stone wall at the entrance of main gate. 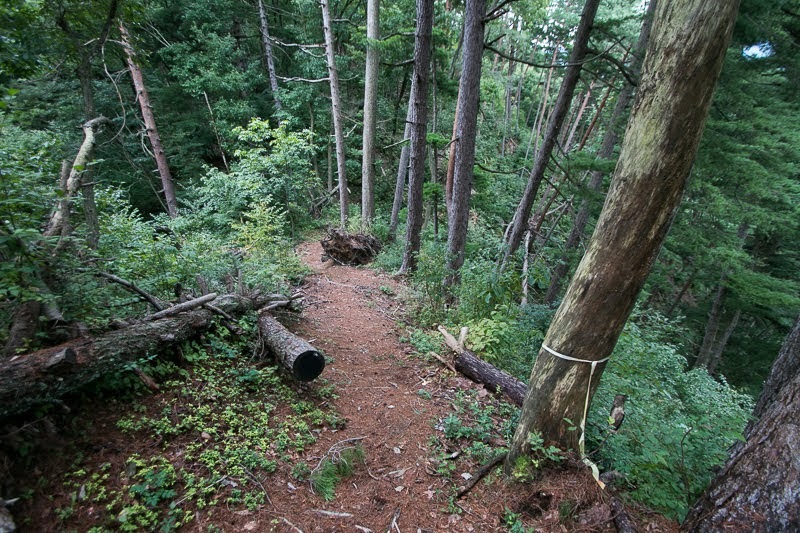 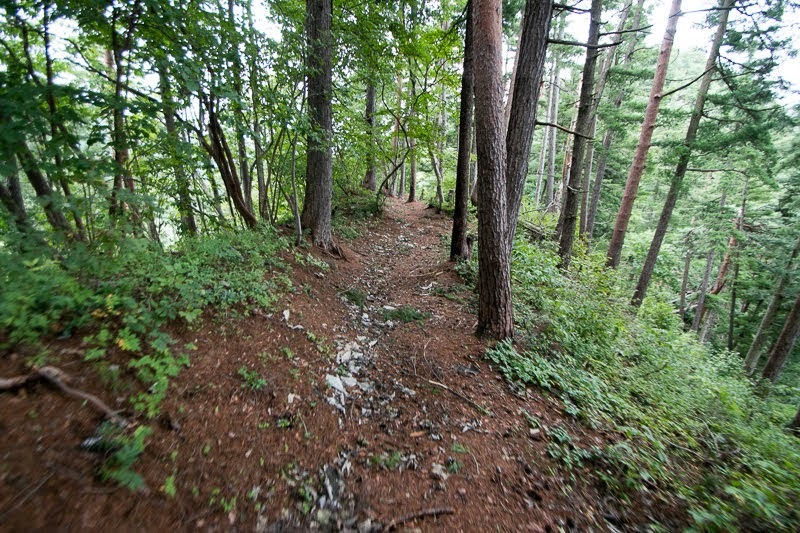 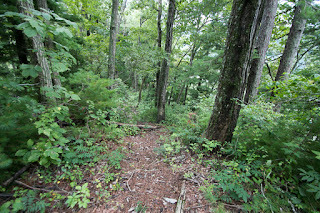 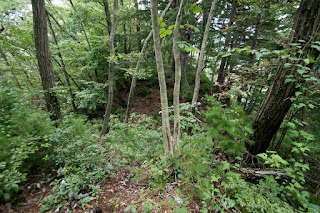 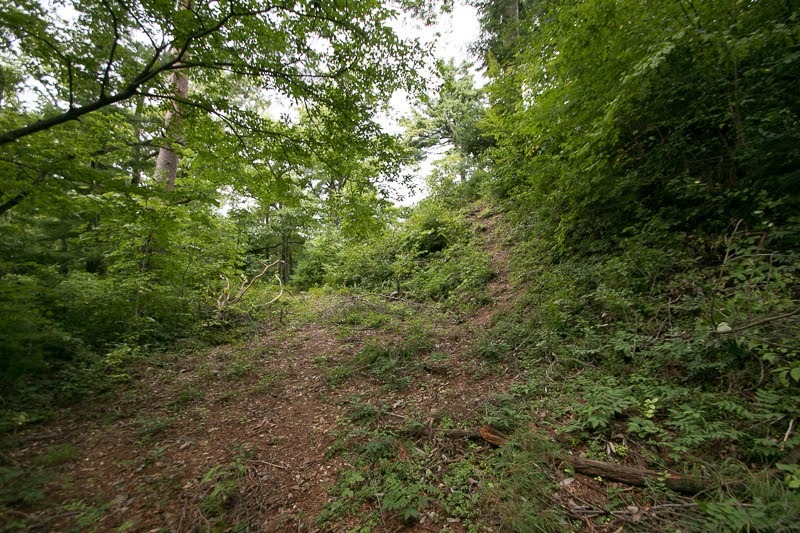 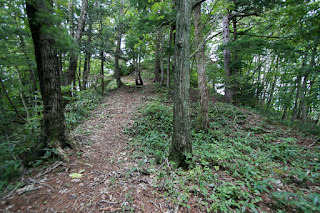 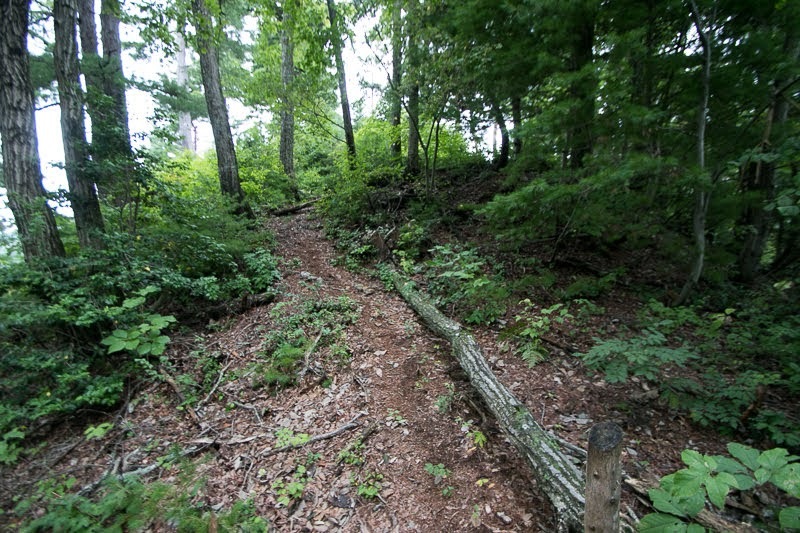 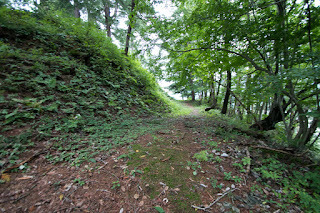 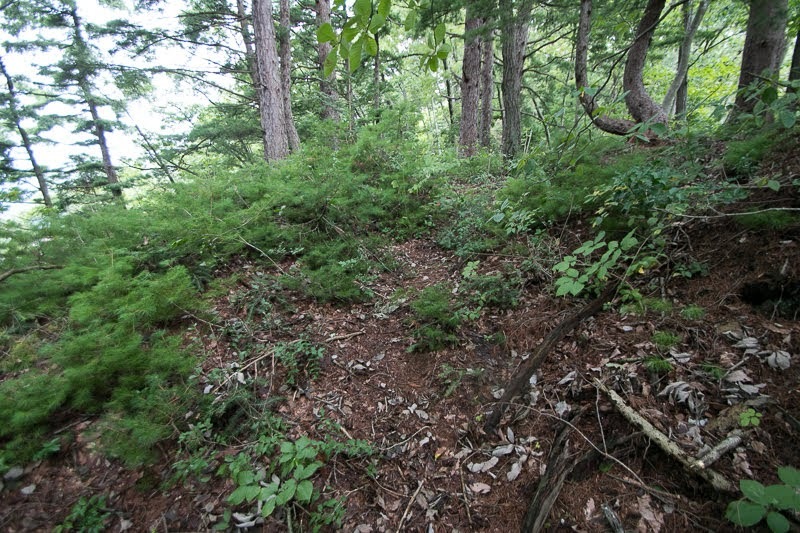 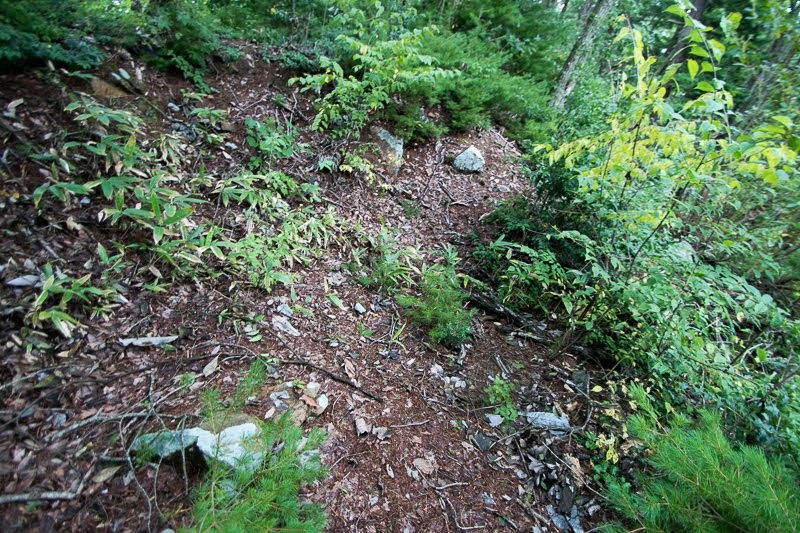 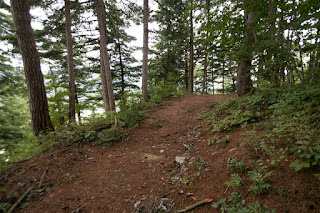 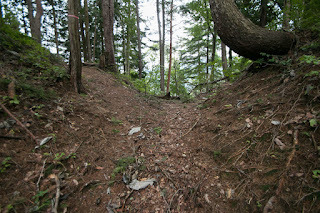 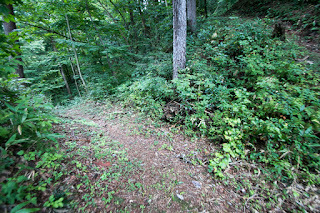 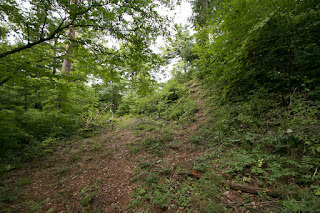 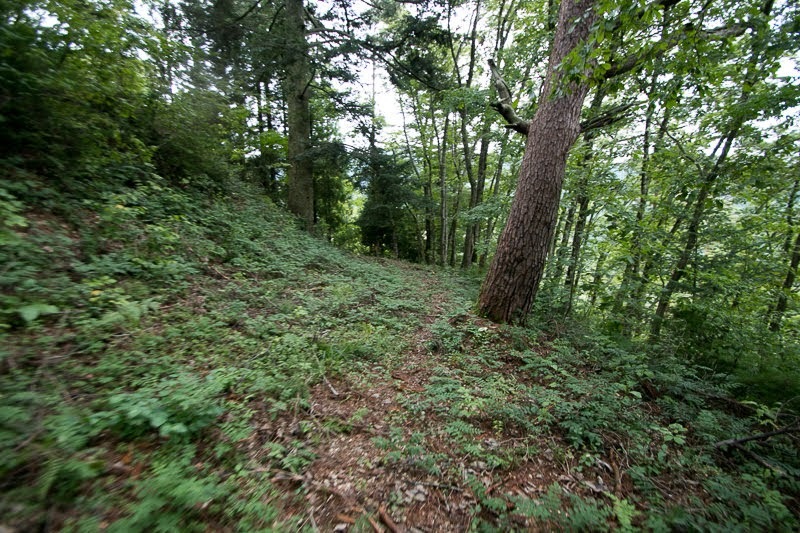 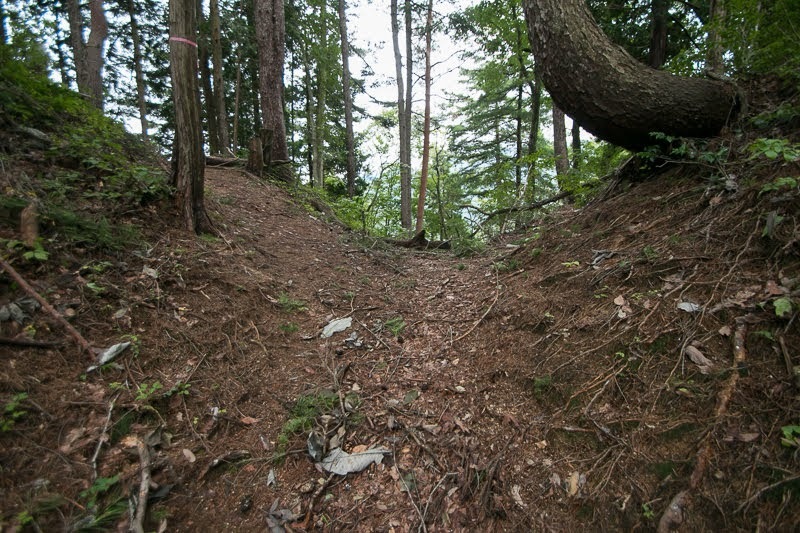 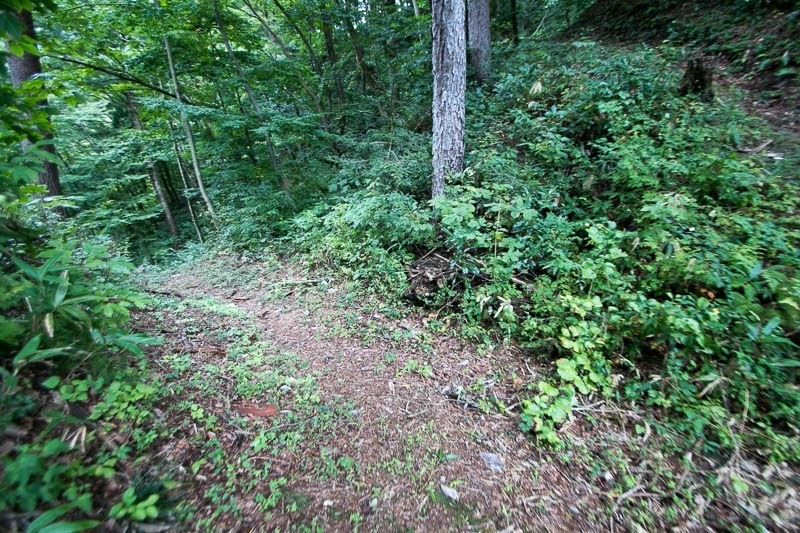 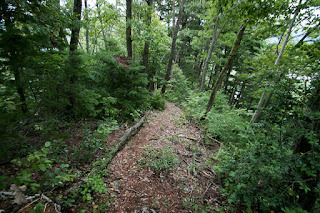 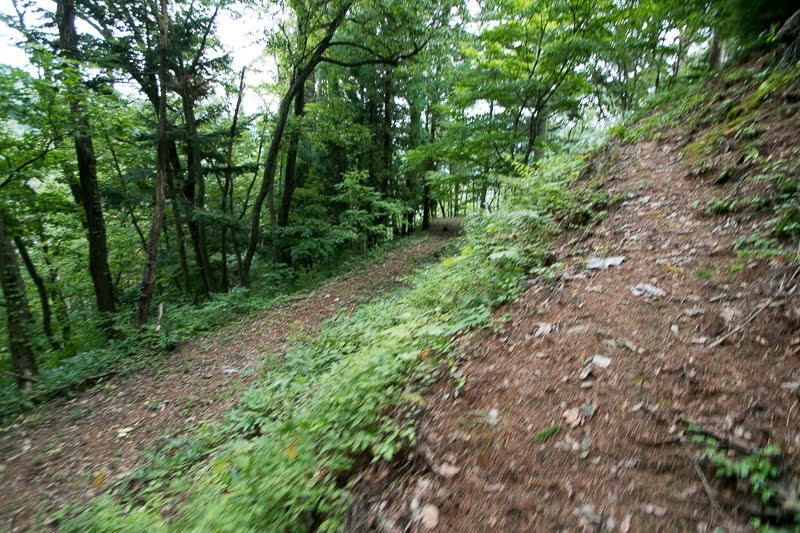 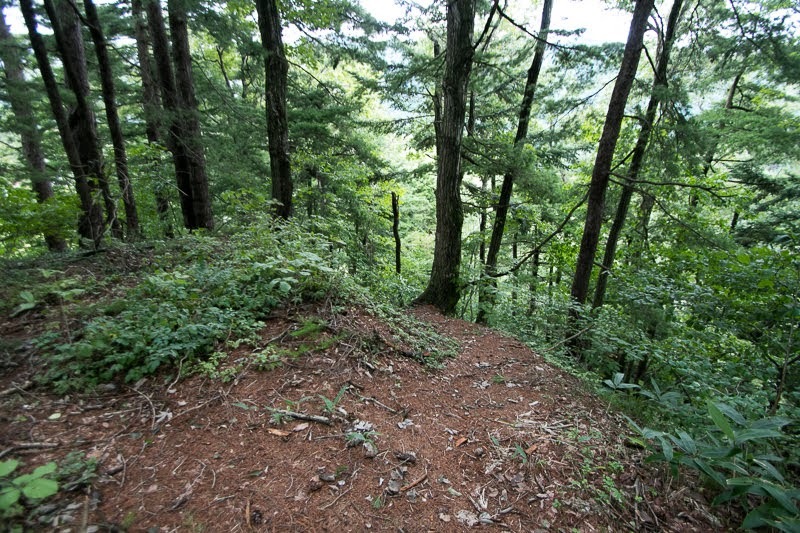 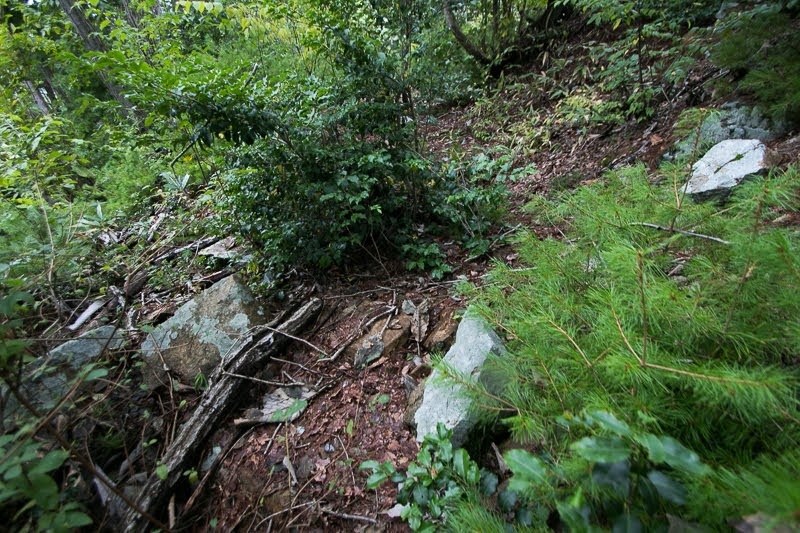 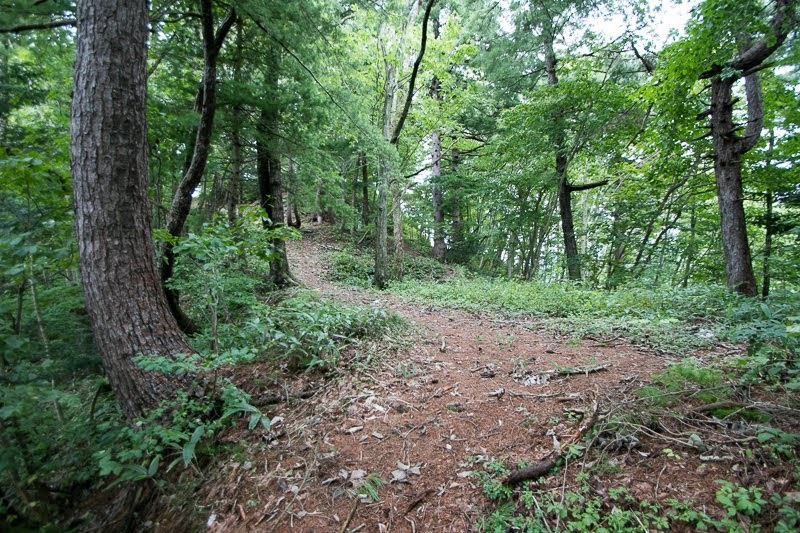 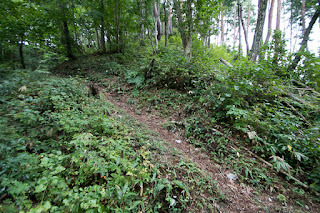 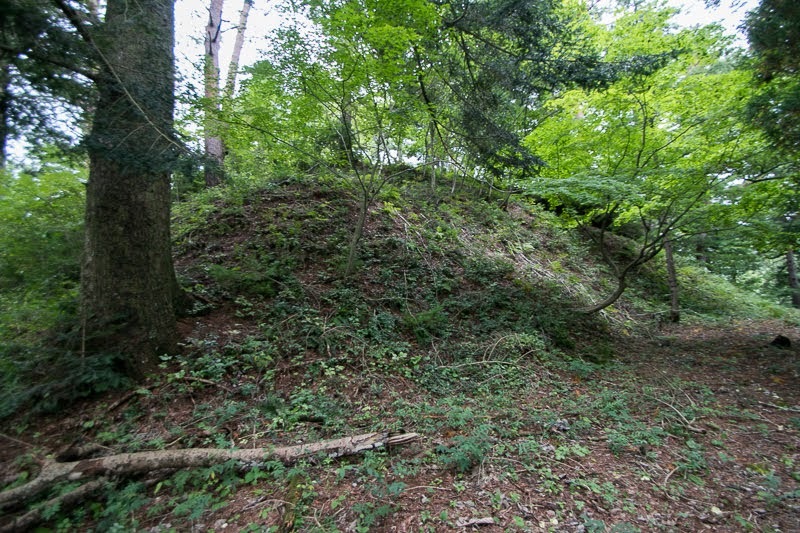 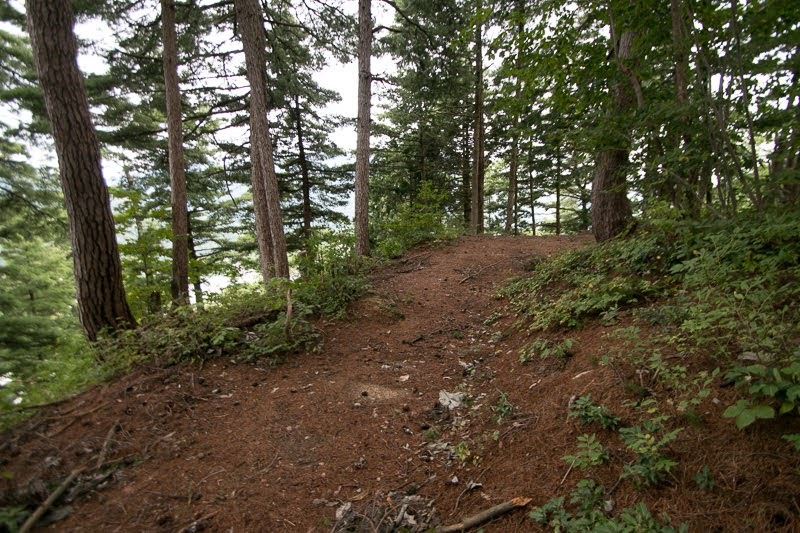 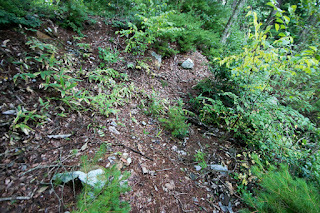 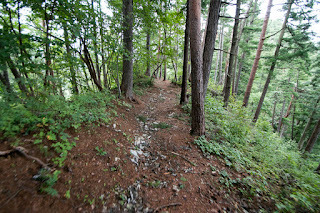 North edge of the castle is also a weak point connecting to backside mountains, this direction is securely protected by combination of horizontal dry moats and line of clay wall protecting the climb of enemy soldiers. 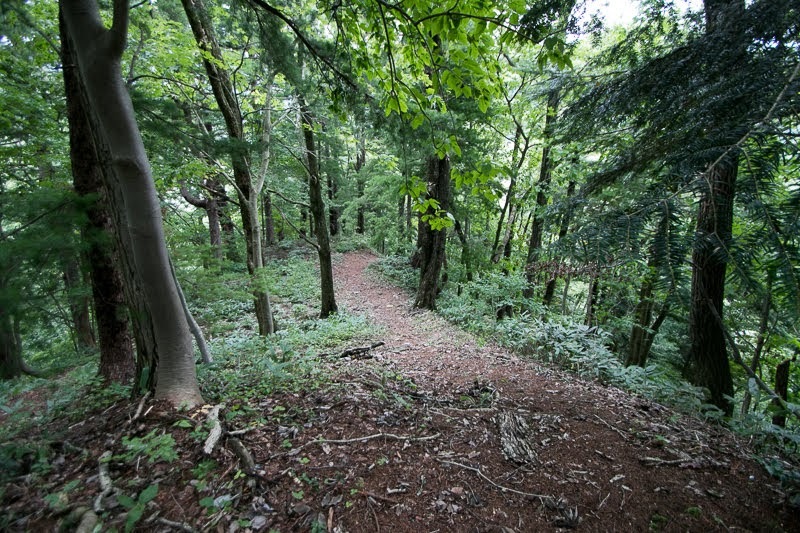 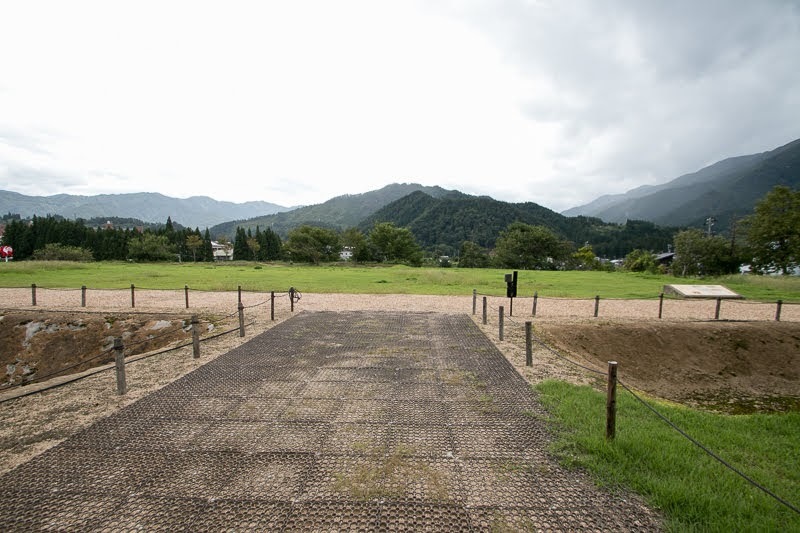 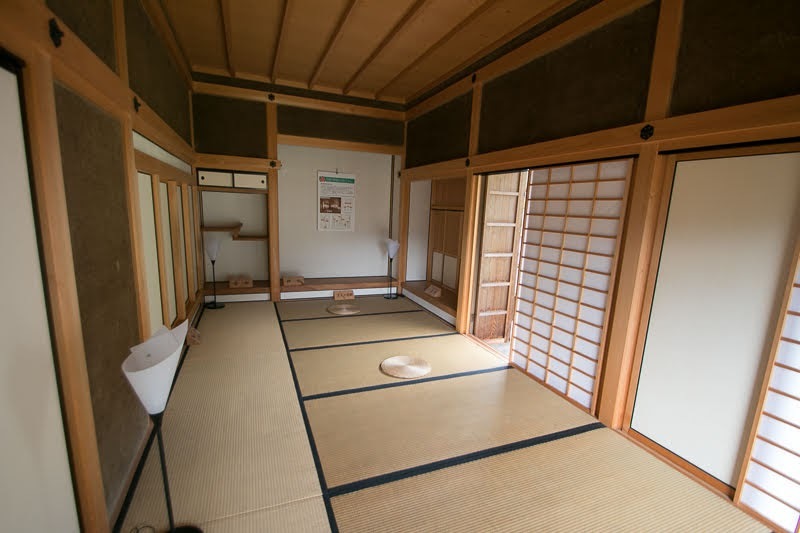 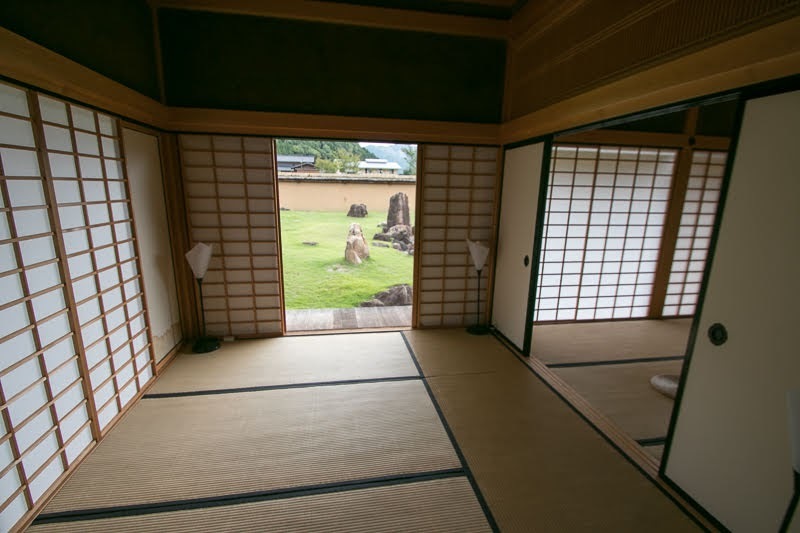 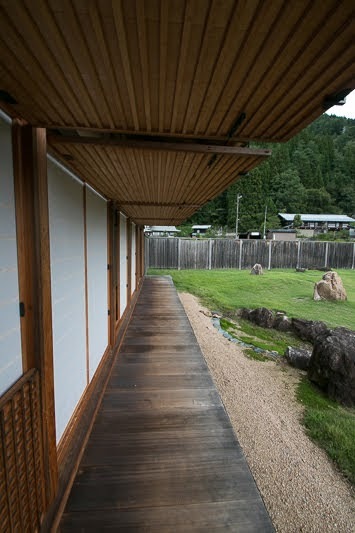 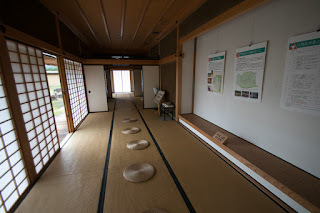 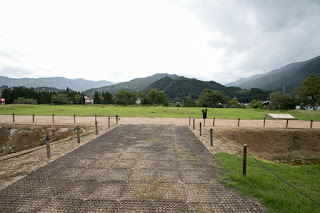 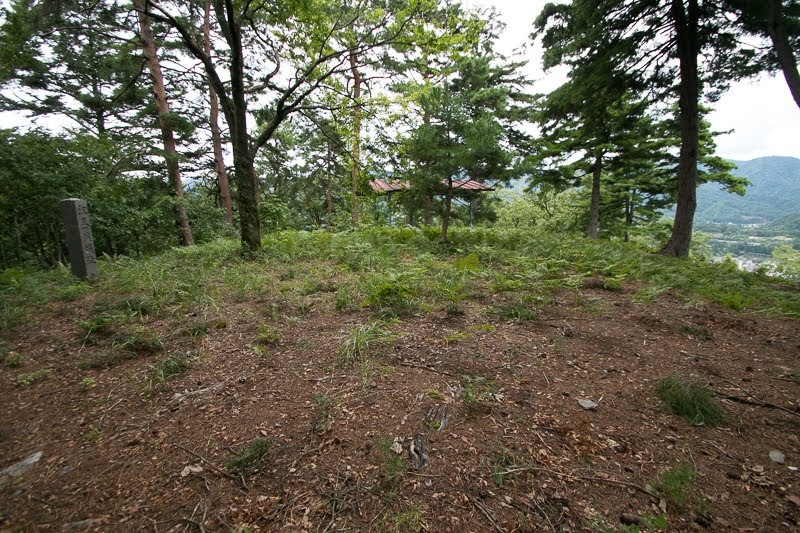 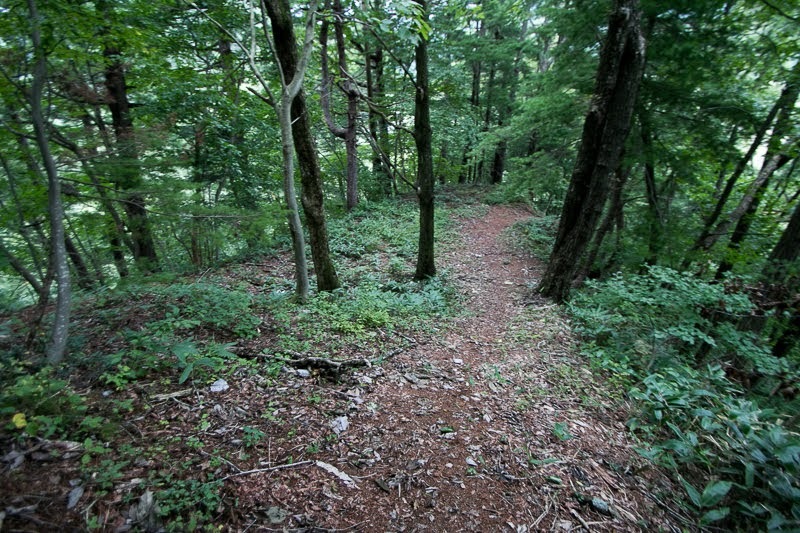 Residence of Ema clan called as “Shimo-Yakata” spreads over a rectangular ground of 200 meter long and 100 meter wide. The core part of the residence is four buildings including residential building, meeting hall, connecting hall and banquet which is a traditional style residence, equips Japanese garden with ponds. Even though smaller but this style is same as strong noble, and this shows the culture of central area brought to Hida province through Anegakoji clan, and wealth of Ema clan to support such residence. 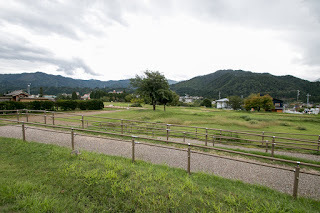 In the former half of 16th century, same as the rise of Ema clan in the north half, Mitsuki clan which was the retainer of Kyogoku clan deprived the territories of surrounding lords then grew to strong local lord. 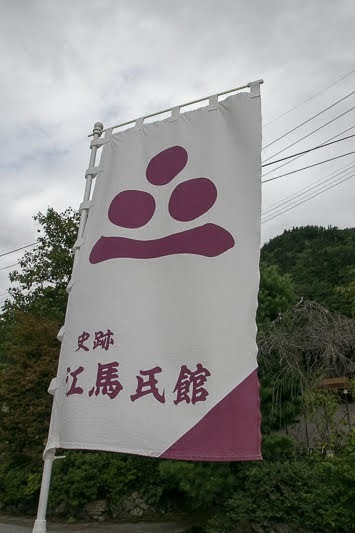 Mitsuki clan broke Takayama clan which held current Takayama city area, then overtook Furukawa family of Anegakoji clan then changed their surname to Anegakoji clan in the middle of 16th century. Now Anegakoji clan aimed at unification of Hida province and became the enemy of Ema clan. 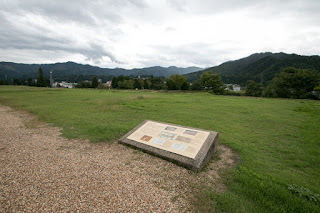 At the same time, Hida province became involved into the conflict of Takeda clan which was the warlord of Kai province (Yamanashi prefecture) which seized Shinano province (Nagano prefecture), and Uesugi clan which was the one of Echigo province (Niigata prefecture). As Hida province was a second front for clans, Takeda clan and Uesugi clan tried to indirectly keep the province through local lords. 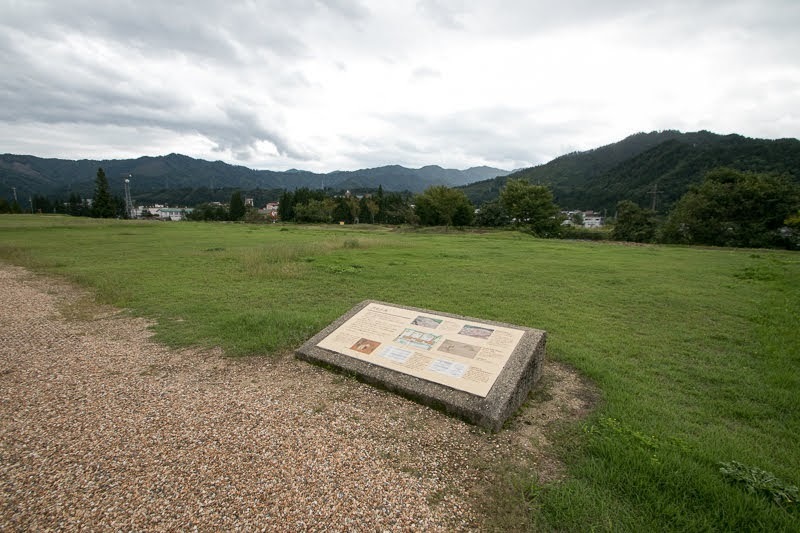 Around this time Yoritsuna Anegakoji (1540-1587), the leader of Anegakoji clan, seized over half of the province and at the first position. 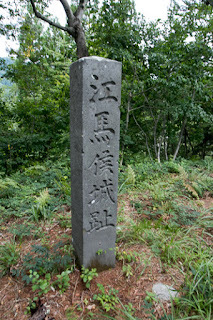 To cope with Anegakoji clan, Ema clan allied with Takeda clan then once Takeda army intruded into Hida province and broke Anegakoji clan in 1559. 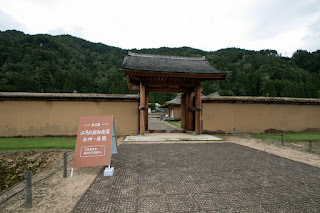 At this time Anegakoji clan once followed to Takeda clan but next connected to Uesugi clan to keep their independence. 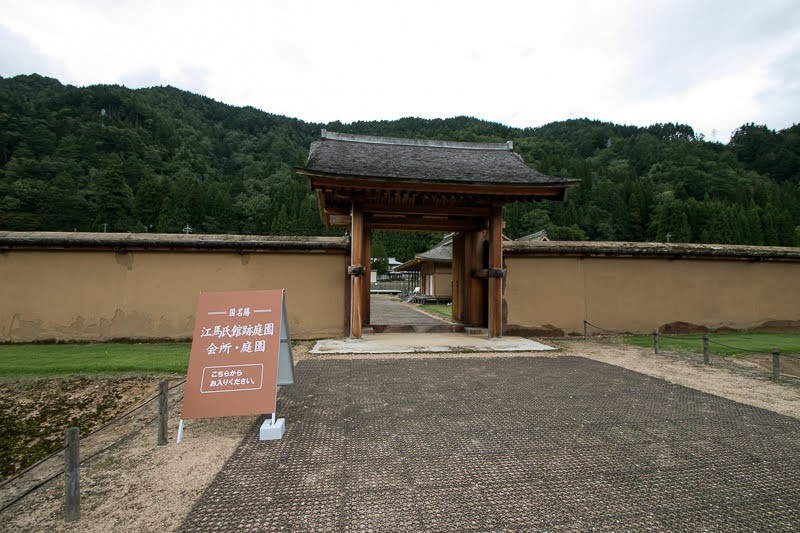 Furthermore, Anegakoji clan was supported by central ruler Nobunaga Oda (1534-1582), who was a brother in law by marriage with the lady of Saito clan which was the governor of Mino province. 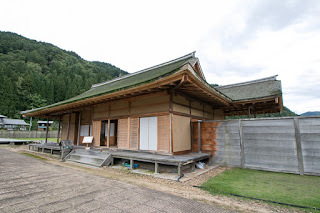 In 1573 Shingen Takeda (1521-1573), the leader of Takeda clan and who supported Ema clan died in ill during the battle against Nobunaga Oda, and Nobunaga escaped his crisis securely established his government. 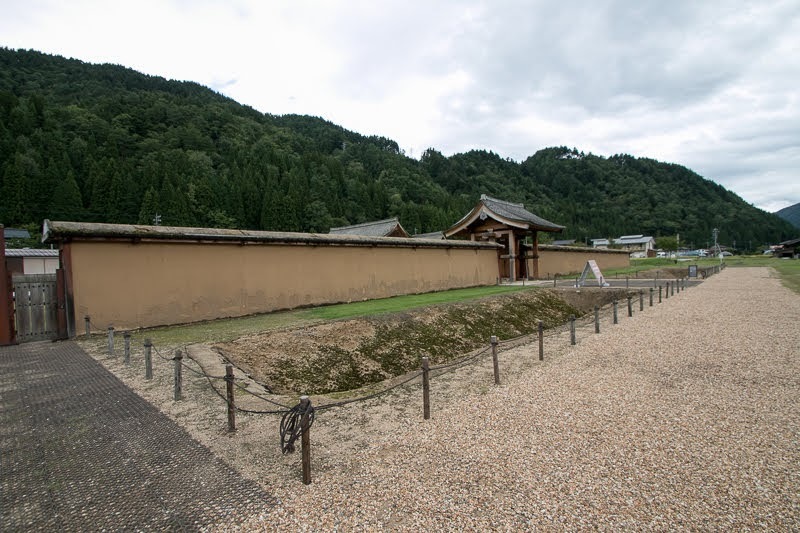 Looking at the death of Shingen, Ema clan turned to Kenshin Uesugi (1530-1578), the leader of Uesugi clan who intruded Hida province in 1576. 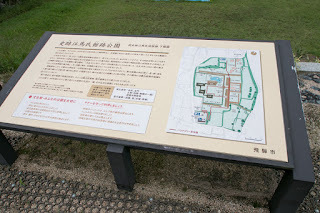 There was a record that leader of Ema clan sent information on the death of Shingen to Uesugi clan.Takahara Suwa castle has the element of castles of Uesugi clan, and it might be brought by Uesugi clan at this time. But Kenshin also died in ill in 1578, and Ema clan lost their supporter again. 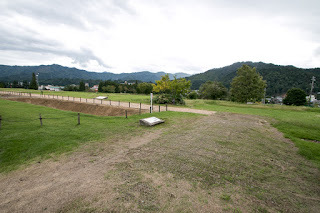 The gap between Anegakoji clan and Ema clan became greater and greater, and Anegakoji clan once intruded into Ecchu province (Toyama prefecture) which was the territory of Uesugi clan being supported by Oda army. 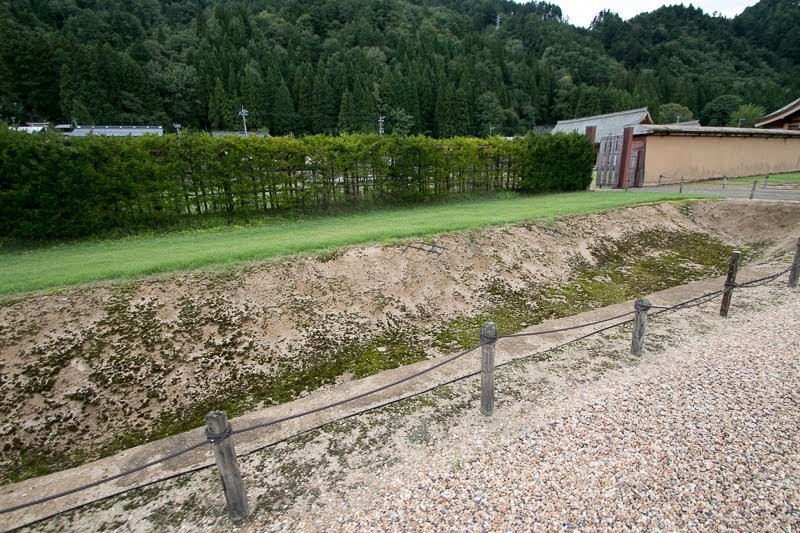 Uesugi clan was forced to the corner by Oda army, and this was same to Ema clan. 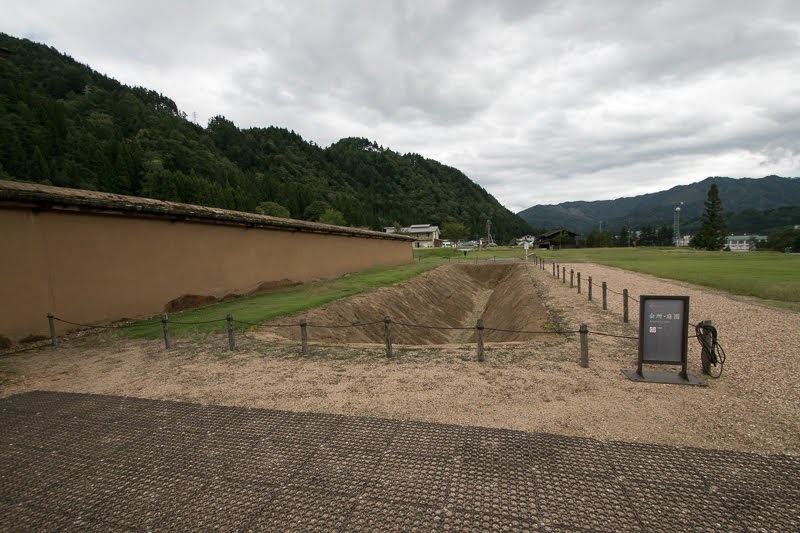 However, in 1582, Nobunaga Oda who ruined Takeda clan suddenly died in the incident of Honnoji, a coup d’?tat by his general Mitsuhide Akechi (1521-1582). Looking this as a last opportunity to reverse the situation, Ema clan raised his army against Anegakoji clan. 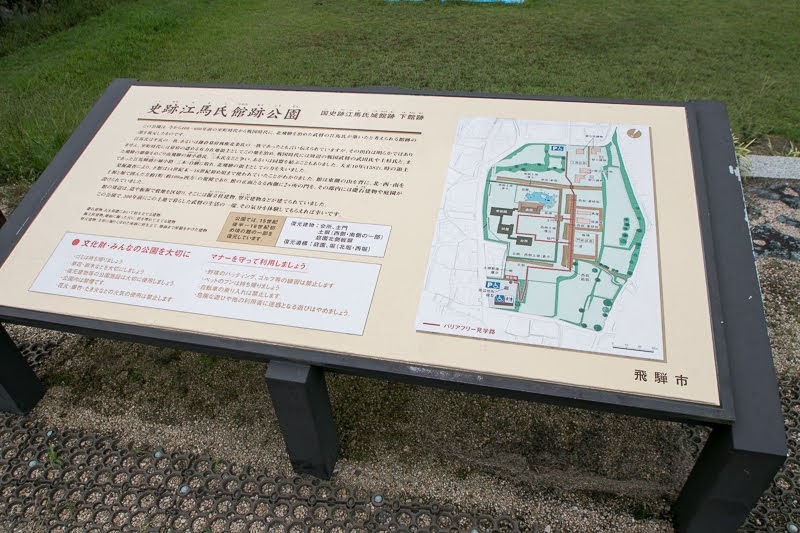 But Ema clan only held 300 soldiers compared with Anegakoji army held 1,000 soldiers. 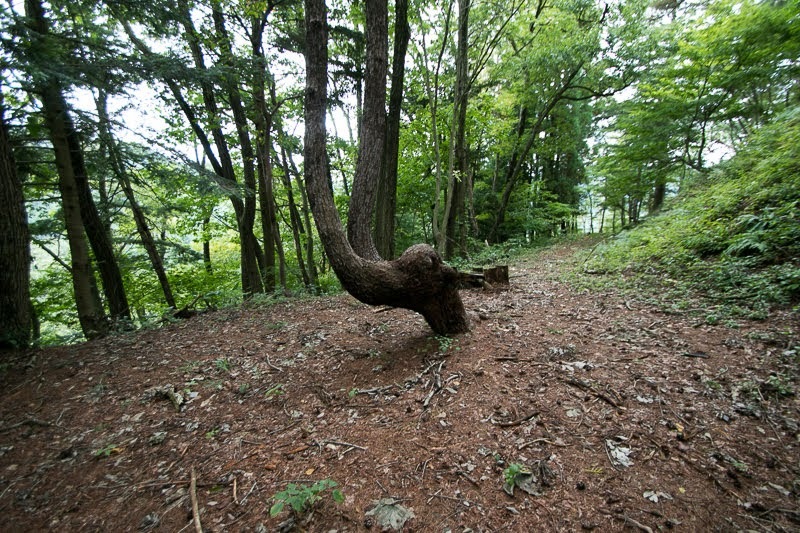 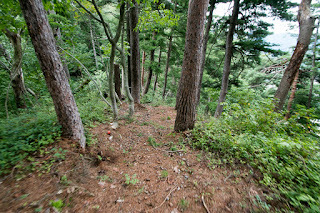 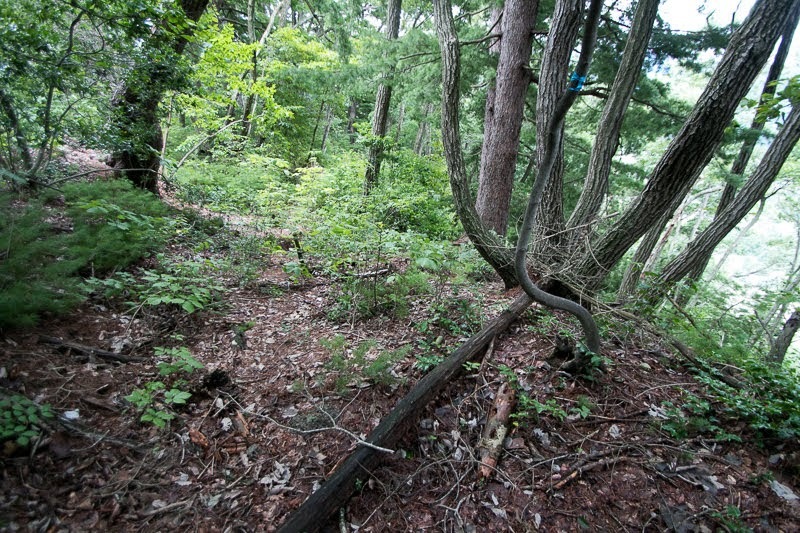 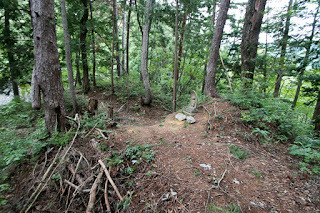 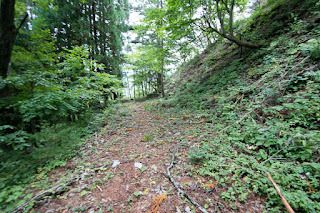 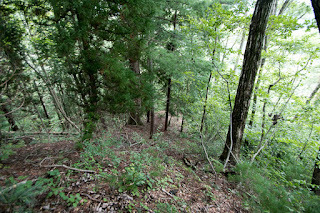 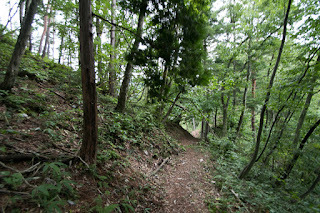 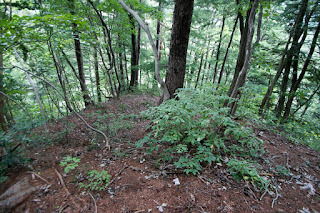 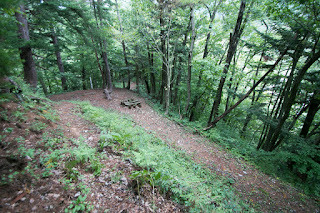 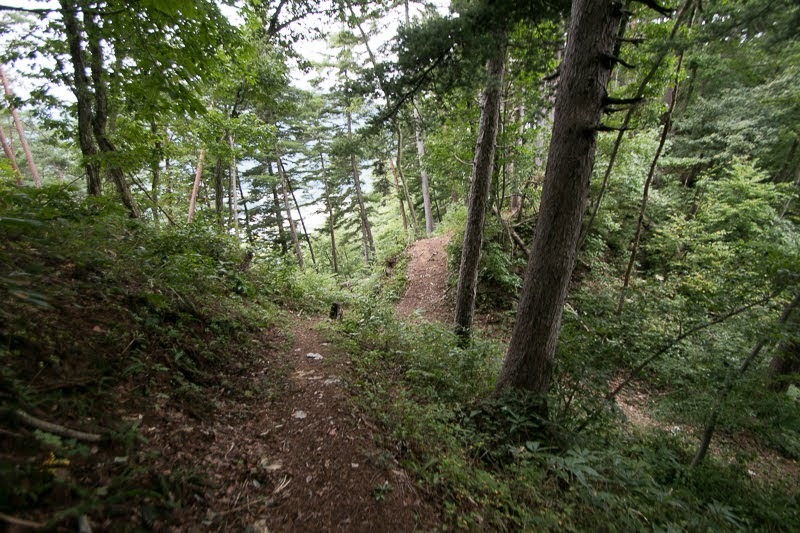 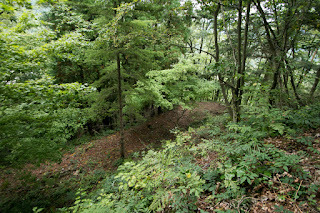 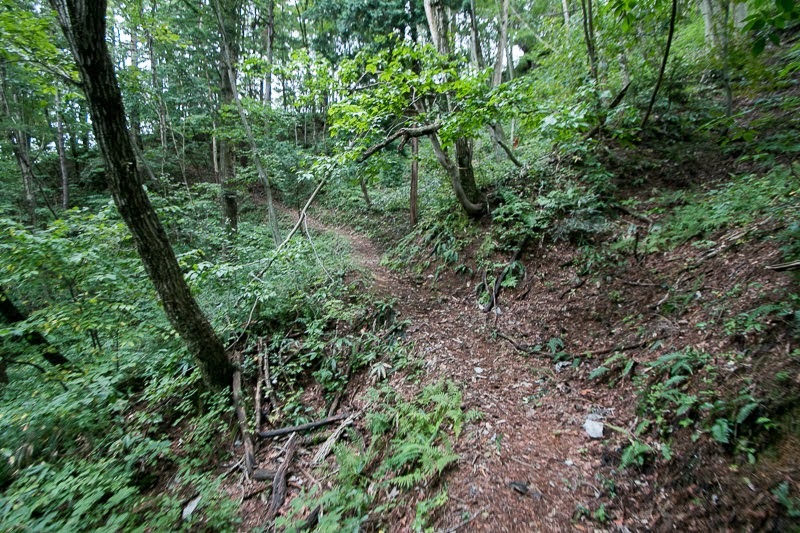 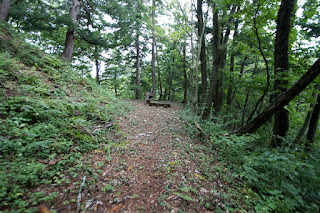 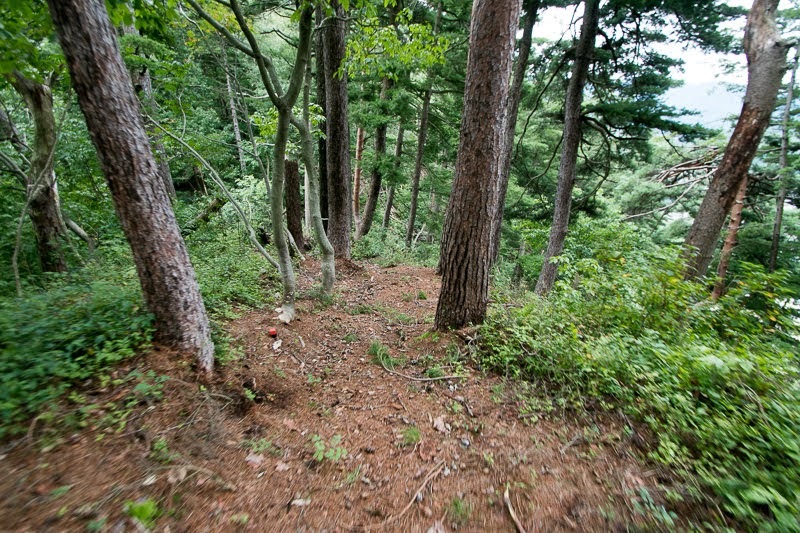 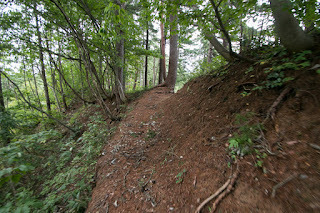 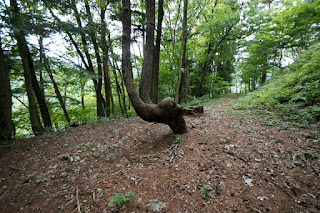 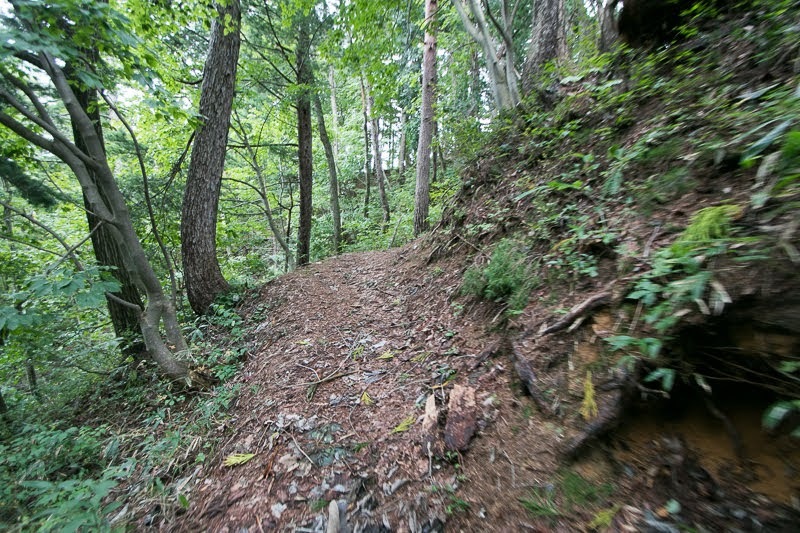 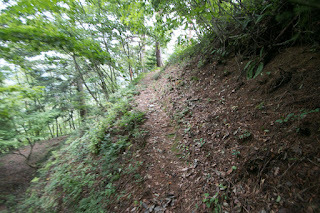 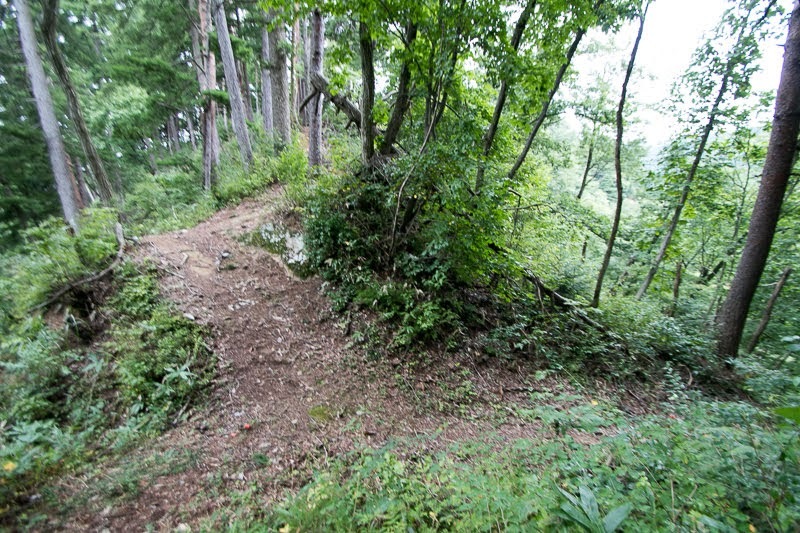 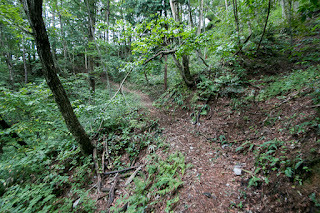 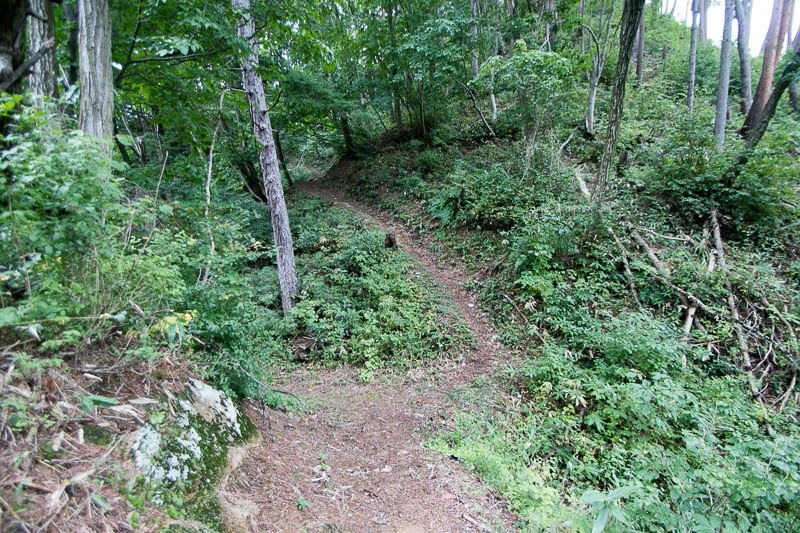 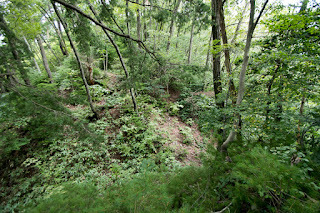 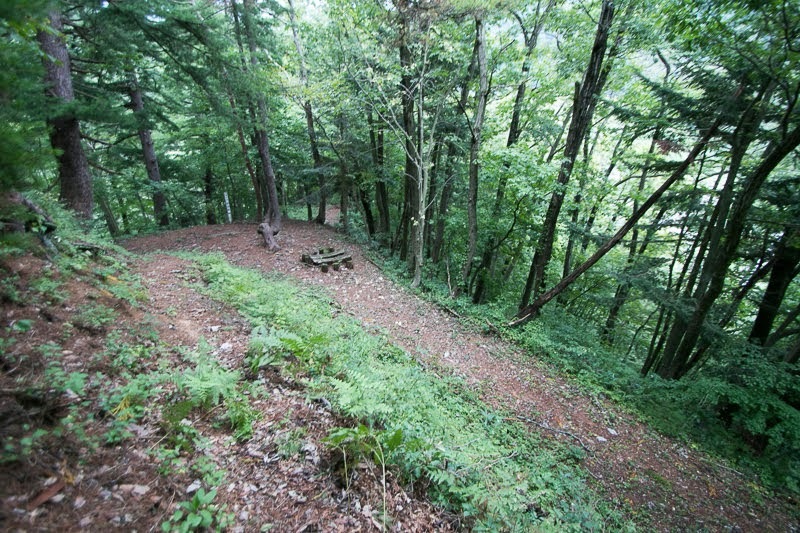 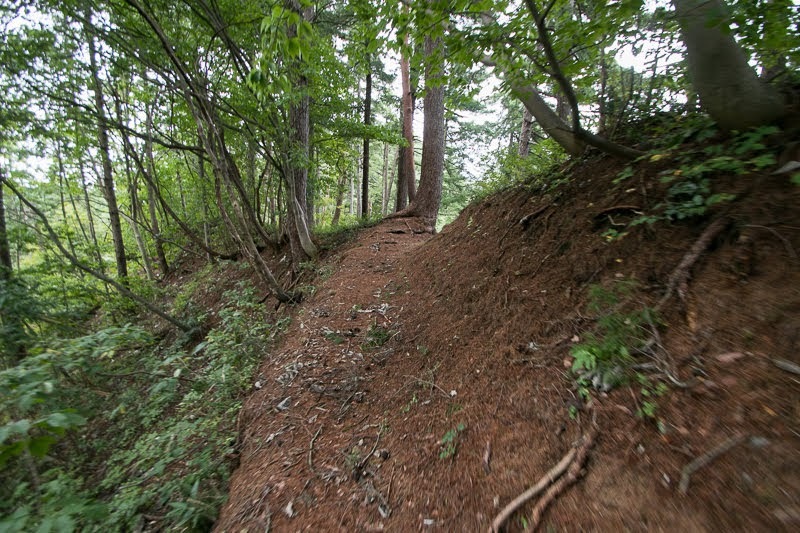 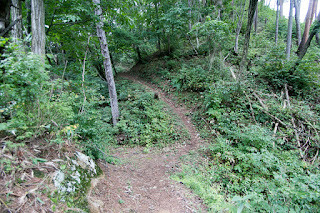 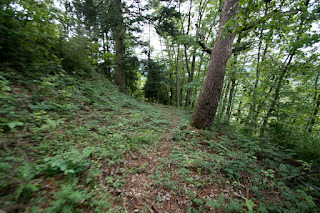 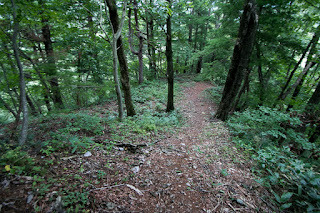 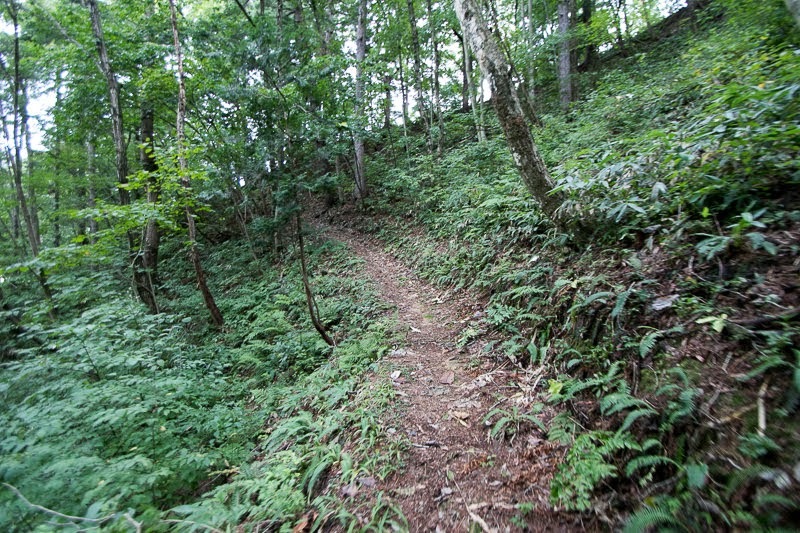 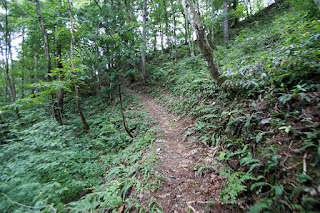 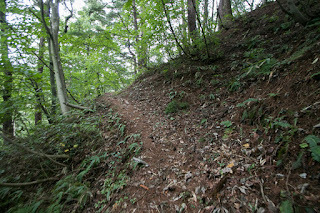 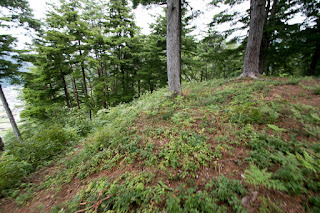 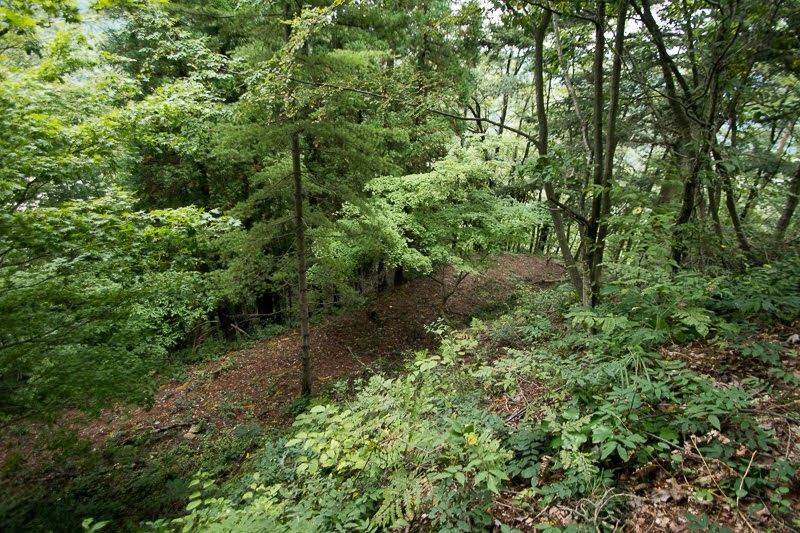 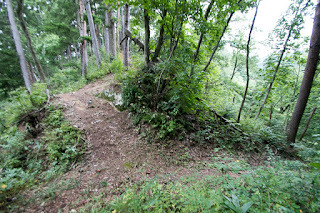 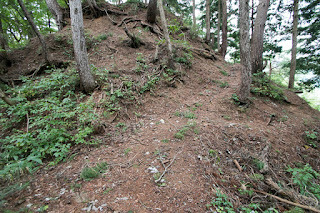 The process of battle is not clear but because of inferior situation, Ema army made sudden attack across the mountain to Kojima castle, the base of Kojima clan which supported Anegakoji clan. But Ema army failed to fall the castle, and on the way of retreat, it faced severe chase of Anegakoji army. Ema army bravely fought, but being shut by matchlock guns of Anegakoji army supplied by Oda clan, then Ema army collapsed and their leader died in the battle. 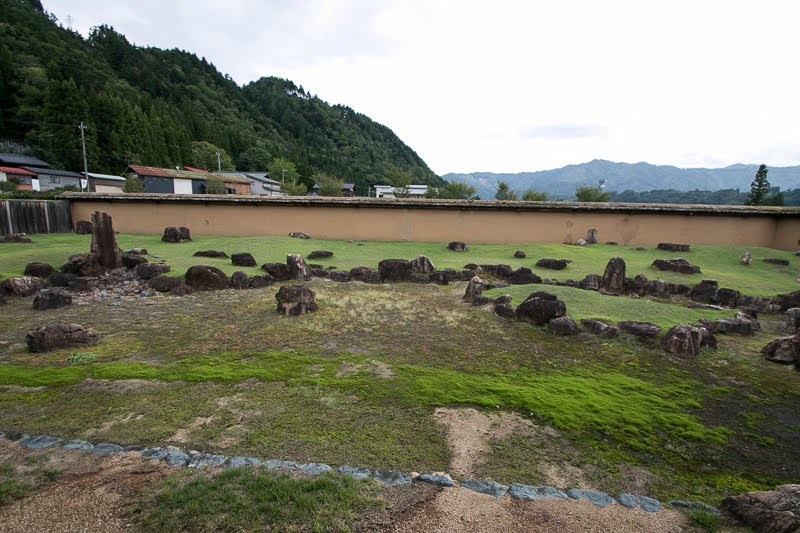 This battle is called as the battle of Yokaichi, and this battle was final round for the hegemony of Hida province among local lords. 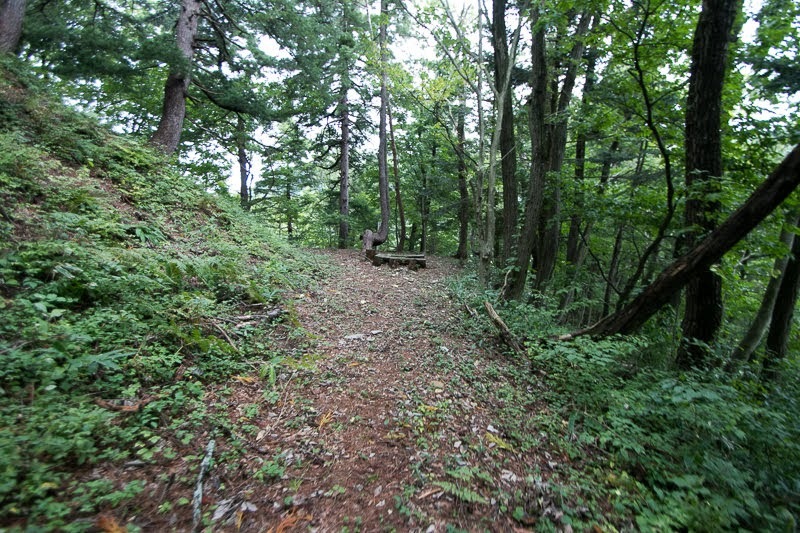 After the battle, Takahara Suwa castle was attacked by Kojima clan and history of Ema clan as local lord had ended at this point. Anegakoji clan once seized most part of Hida province, but they were also involved in the conflict between their master Narimasa Sassa (1536-1588) and central ruler Hideyoshi Toyotomi (1537-1598) then lost Hida province in 1585. 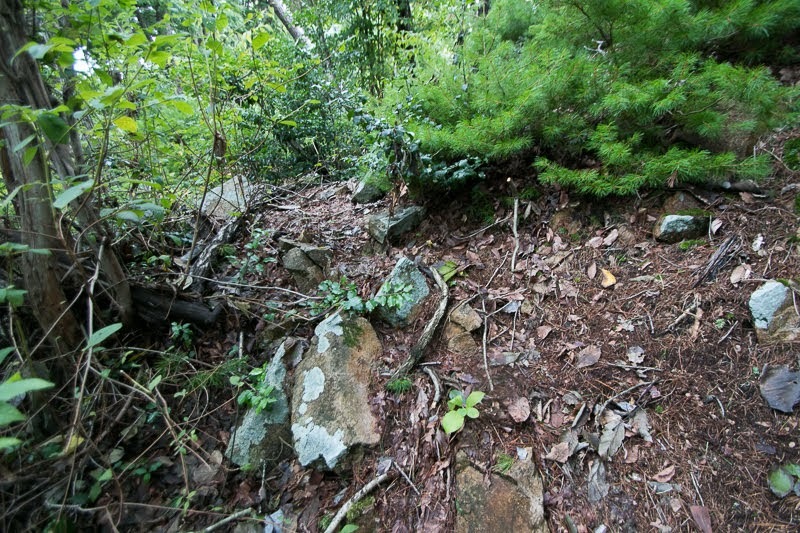 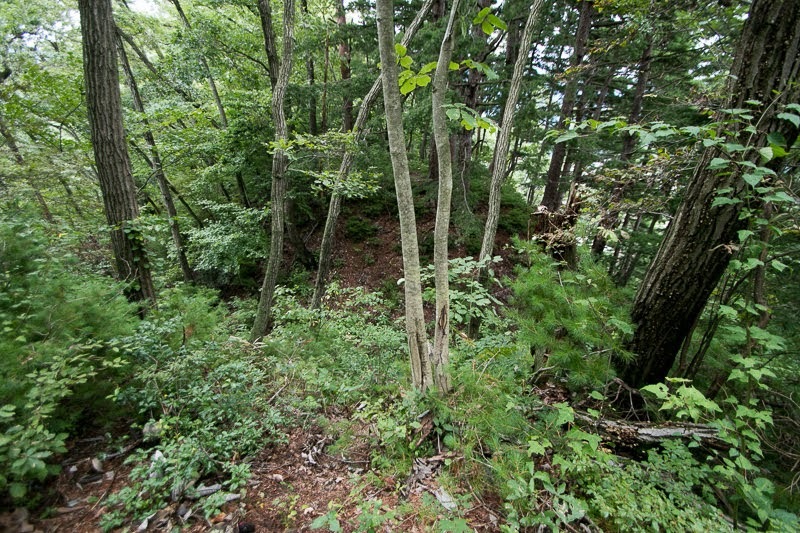 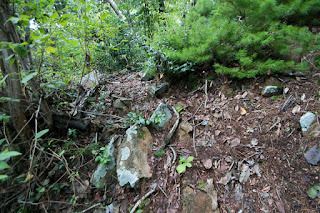 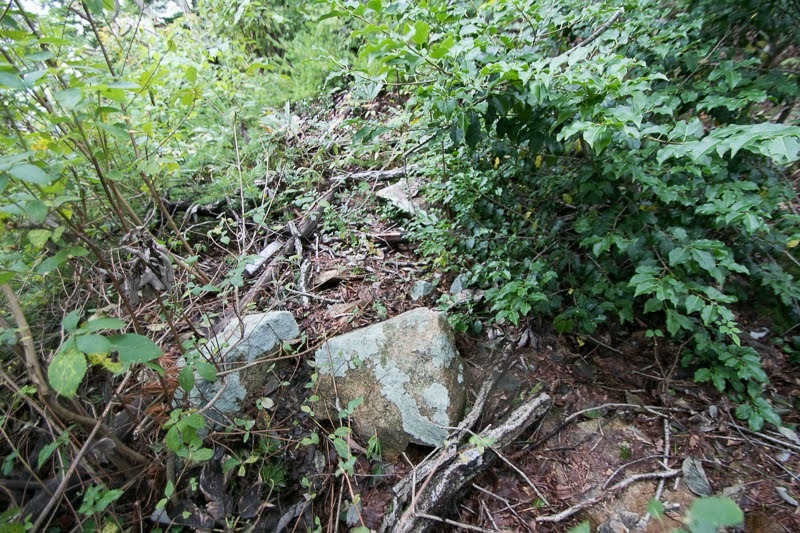 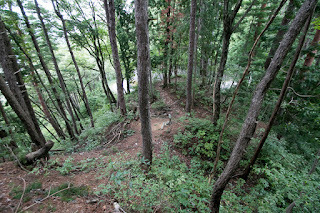 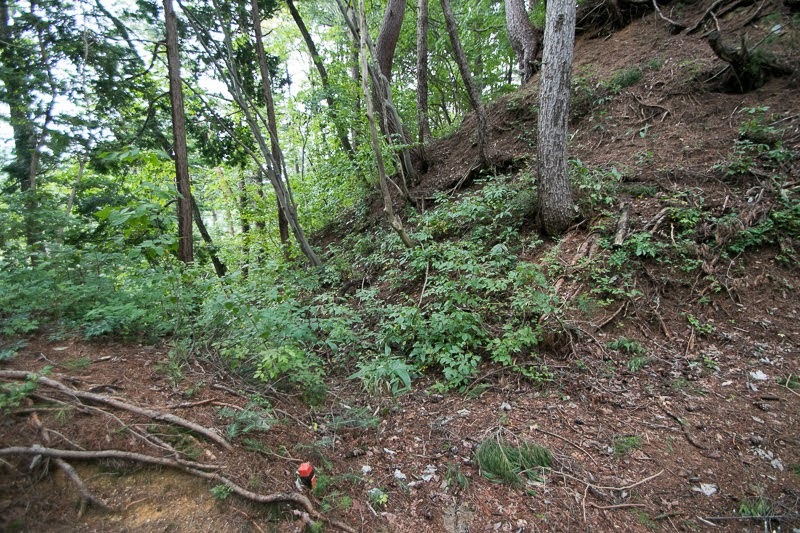 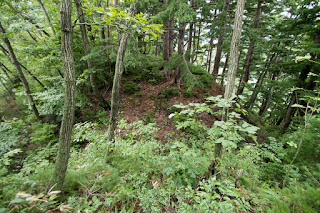 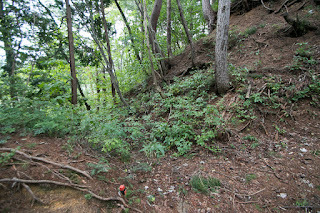 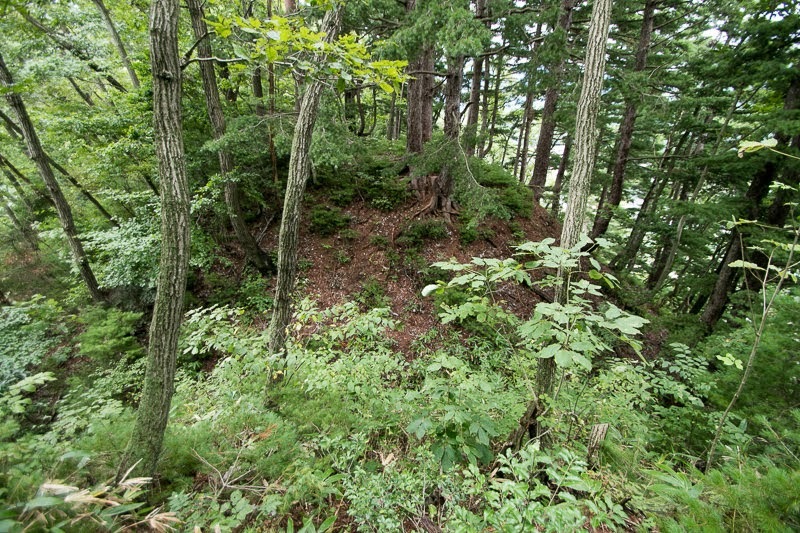 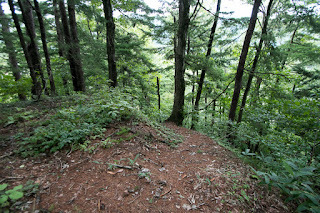 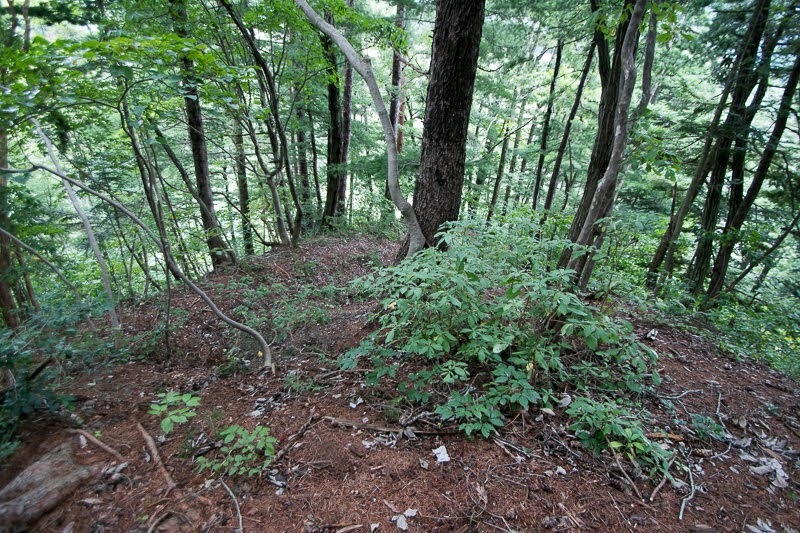 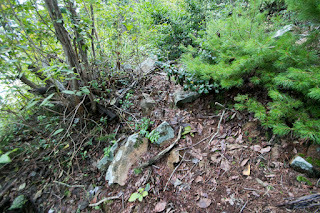 Now no building remains for Takahara Suwa castle but its structure well remain on the mountain. 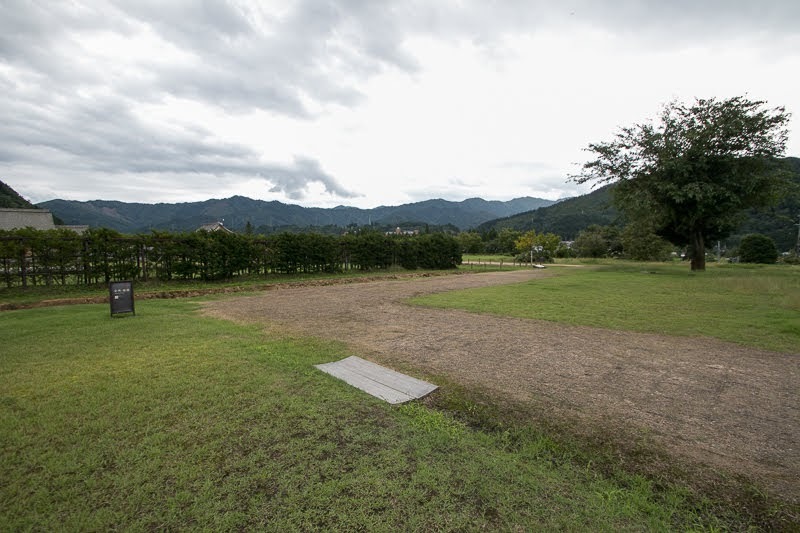 Site of Shimo-Yakata residence once disappeared into rice field, but was recently excavated then meeting hall and Japanese garden was restored with outer wall and main gate. 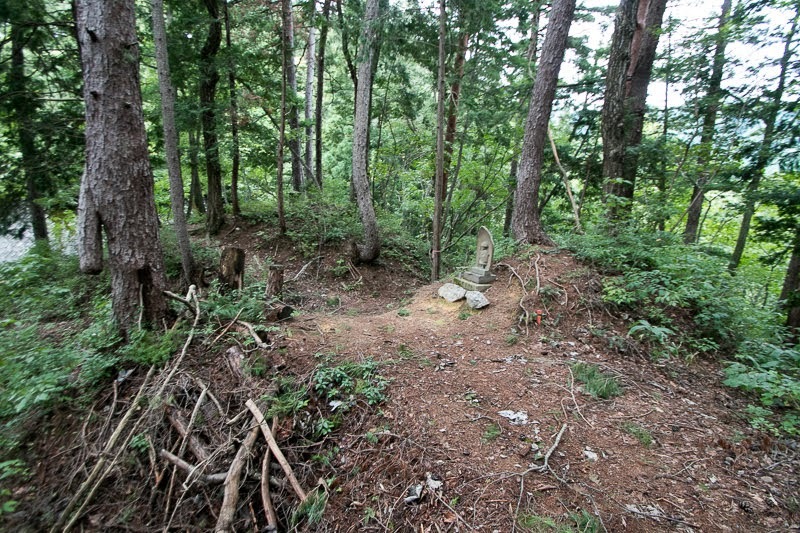 Ruins of Ema clan shows both of fiscal strength of the clan, and difficulty of survival for small lord with limited army intervened by strong external powers. 60 minutes drive from Tokai-Hokuriku Jidoshado Expressway Hida-Kiyomi interchange.